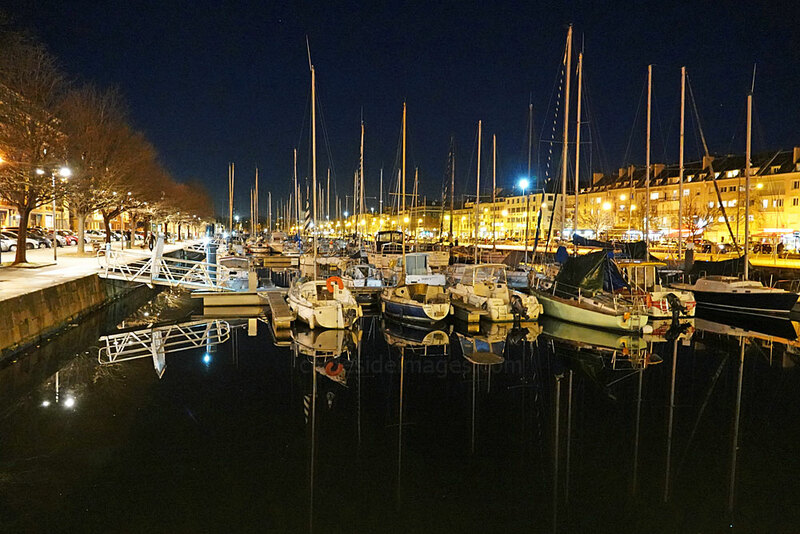 Caen is the capital of the Calvados department in the Normandy region of Northern France. 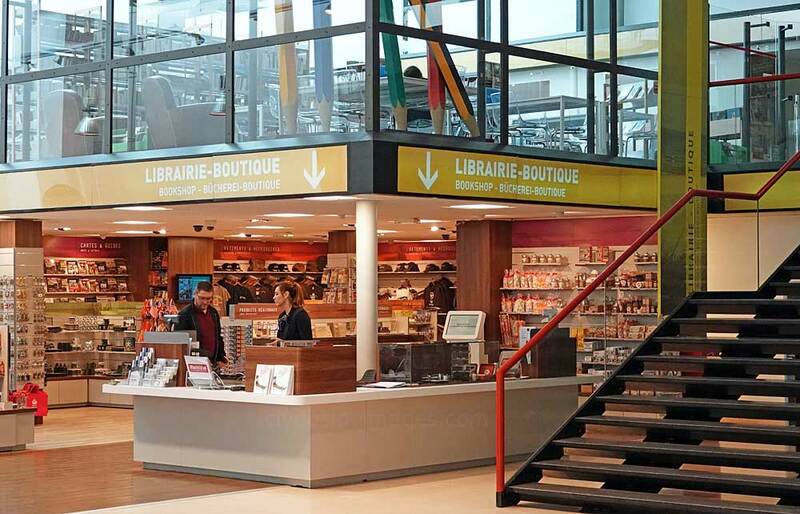 Although it lies approximately 9 miles (14 km) from the coast, it is a port city connected to the English Channel by the Caen Canal and Orne River, plus it acts as a transport hub with several important roads and railway lines emanating from its centre. The city`s historic area features the Château de Caen, a castle built by William the Conqueror around 1060. The fortress stands on a hill flanked by the Romanesque abbeys of Saint-Étienne and Sainte-Trinité, which both date from the same period. 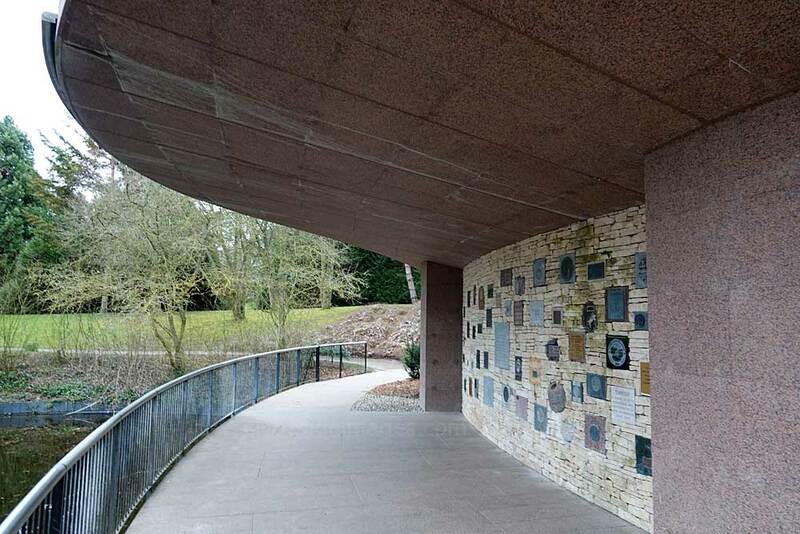 I only spent two nights here, using the hotel as a base for visiting the D-Day sites at the east end of the landing grounds, so there was insufficient time to explore the city itself, apart from checking out the Caen Memorial (see below). 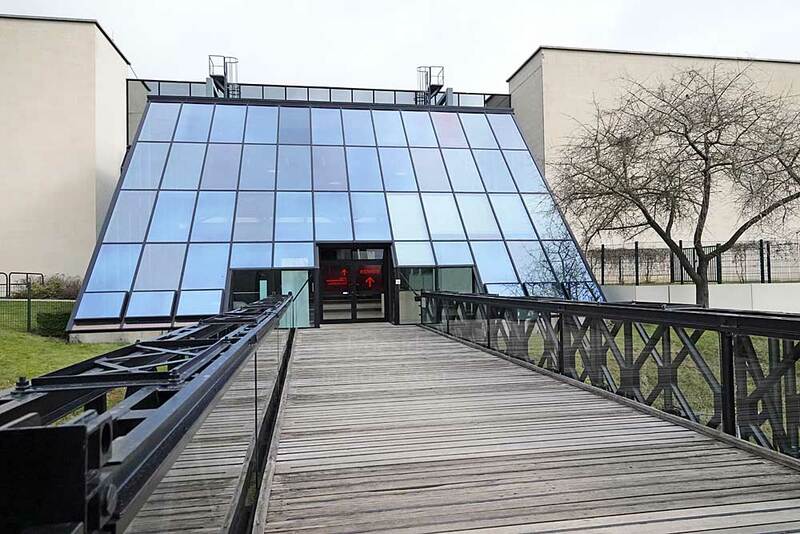 I stayed at the excellent Mercure Caen Centre Port de Plaisance Hotel which is situated next to where the above view was taken. The rooms were decent and the staff helpful, plus although it was off-season, there were several dining options within a few minutes walk. I didn`t try the in-house restaurant, apart from at breakfast. 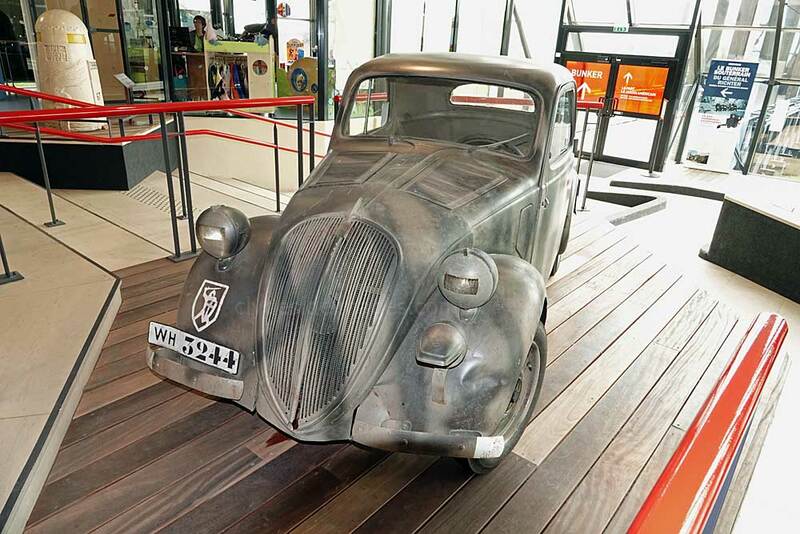 Parking can be a bit of a nightmare, especially in the city centre but the hotel has its own basement car park with a daily fee payable at reception. 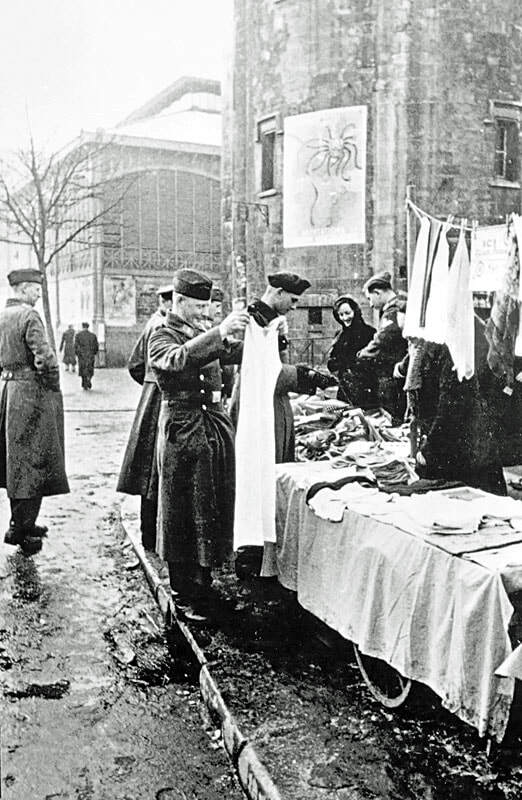 Following the German invasion of France and the Low Countries during the summer of 1940, and the subsequent Armistice, France was divided into a German Occupation Zone in the north and west and a "Free Zone" (zone libre) in the south. 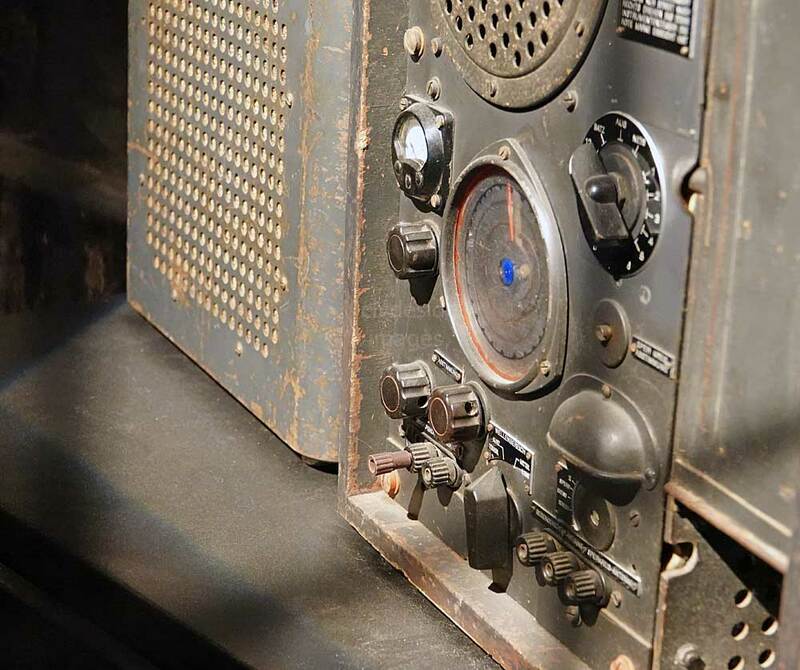 ​On 17 June 1940, the day on which Marshall Petain made a radio broadcast requesting French soldiers to lay down their arms, the lead elements of the Wehrmacht arrived in the South Calvados area of Normandy. 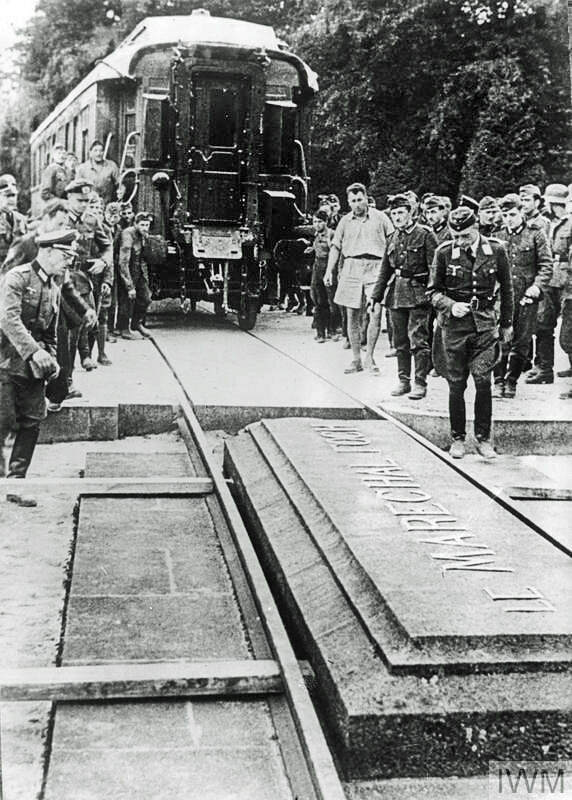 Saturday 22 June 1940: German troops position the rail carriage for the signing of Armistice terms with France on the exact spot in Compiegne Forest where, in 1918, the French had dictated terms to a defeated Germany. 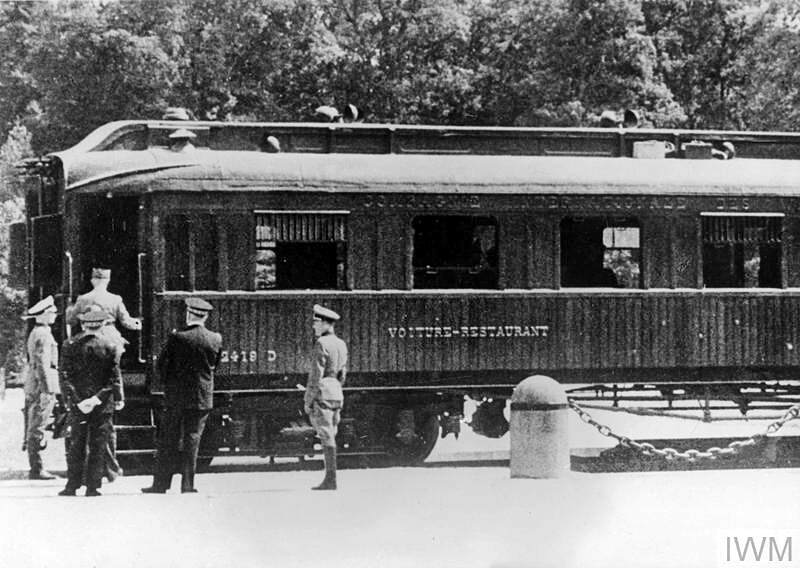 The other shot shows General Charles Huntziger and other officers entering the rail carriage for the official signing ceremony. 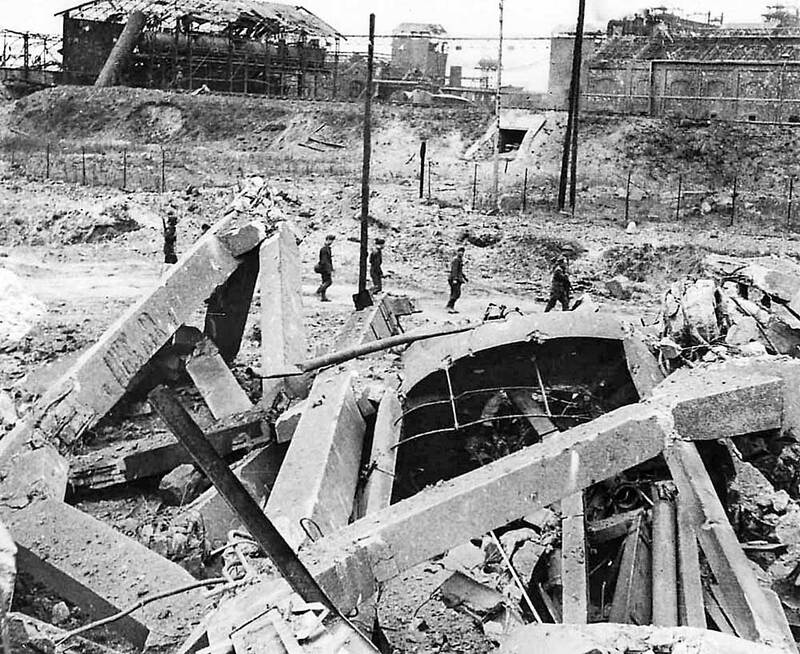 The divisions of the 16th French Army Corps had attempted to form a stop-line which Rommel`s tanks easily outflanked and advanced rapidly towards the port of Cherbourg which fell two days later. Caen was also surrounded. 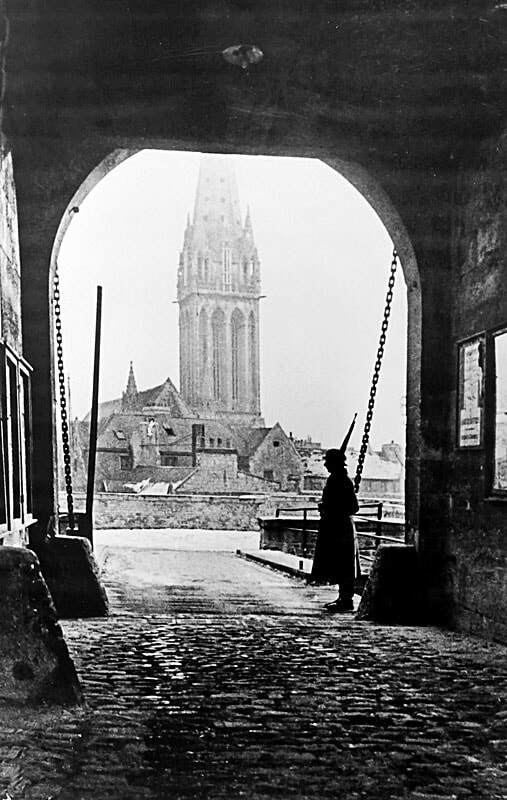 As the population of Caen filtered back to the city after the fighting had ended, the extent of the defeat and evidence of the German military occupation were felt immediately. French society as a whole was forced to adapt quickly to the new regime of restrictions. curfews, deprivation and checks on a daily basis. the Channel coast. Road signs in German soon appeared and entertainment venues were reserved for the Occupation forces. The Feldkommandantur site, symbolising the power of the victorious invader, was set up in the Hotel Malherbe on Caen`s Place Foch. This was where the French had to go to register and comply with other administrative procedures forced upon them by the Occupier. 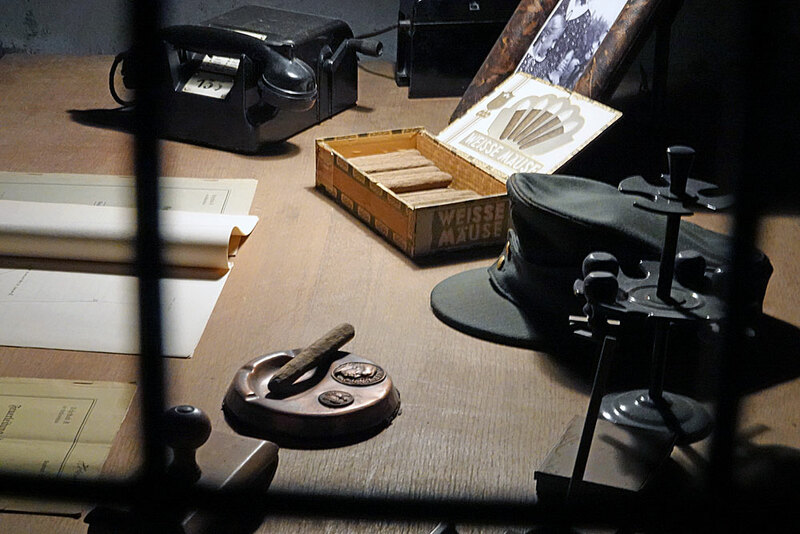 The Pegasus Memorial Museum (below) also has a small display relating to the German occupation of the city. 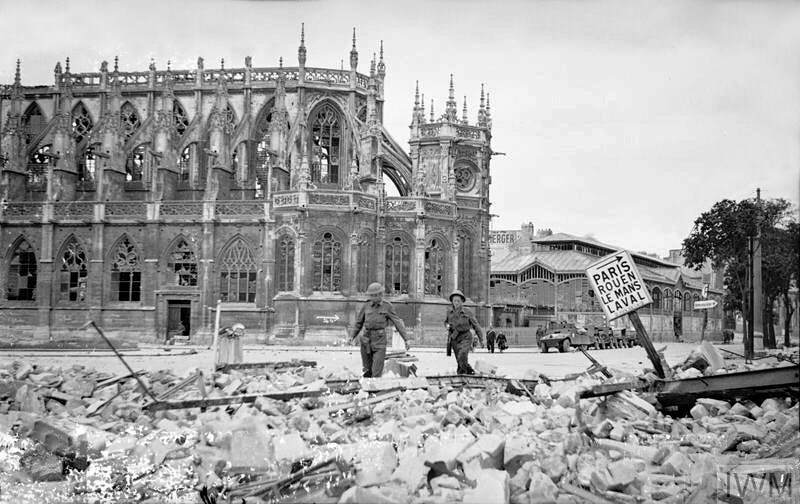 The Battle for Caen, which lasted from D-Day (6 June 1944) until early August 1944, is the name given to the prolonged, bitter fighting between the British Second Army and the German Army`s Panzergruppe West. 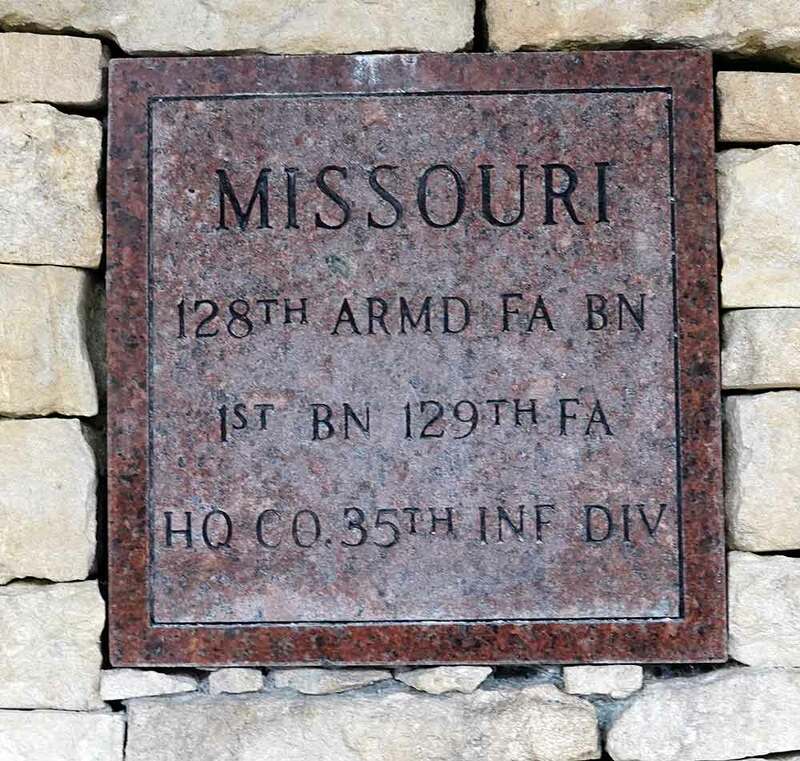 The city`s strategic location made it a vitally important operational objective for both sides. 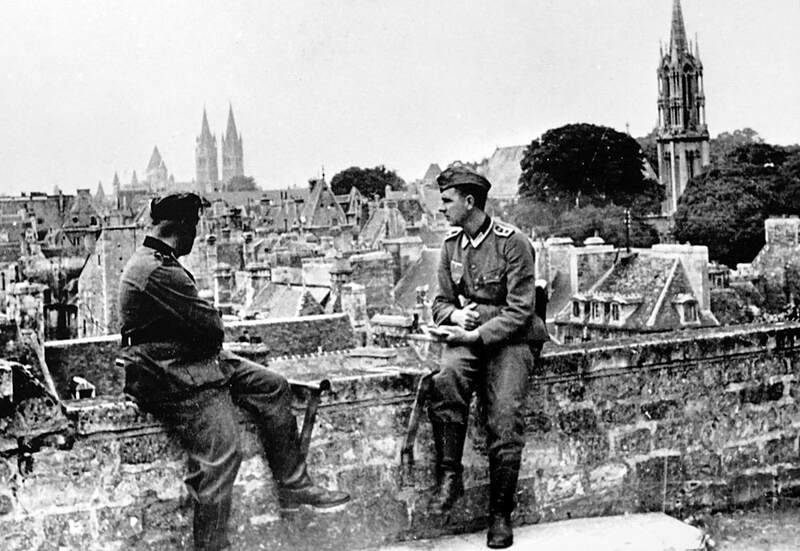 Caen was low-lying and the area to the south comprised rolling, more open farmland rather than the thick bocage country encountered in western Normandy. The Allied Commanders intended to push inland as soon as possible, capture Caen, open the deep water port at Cherbourg, clear the Germans from Normandy, and push on towards Paris. Canadian troops advance to contact near Troarn, east of Caen. 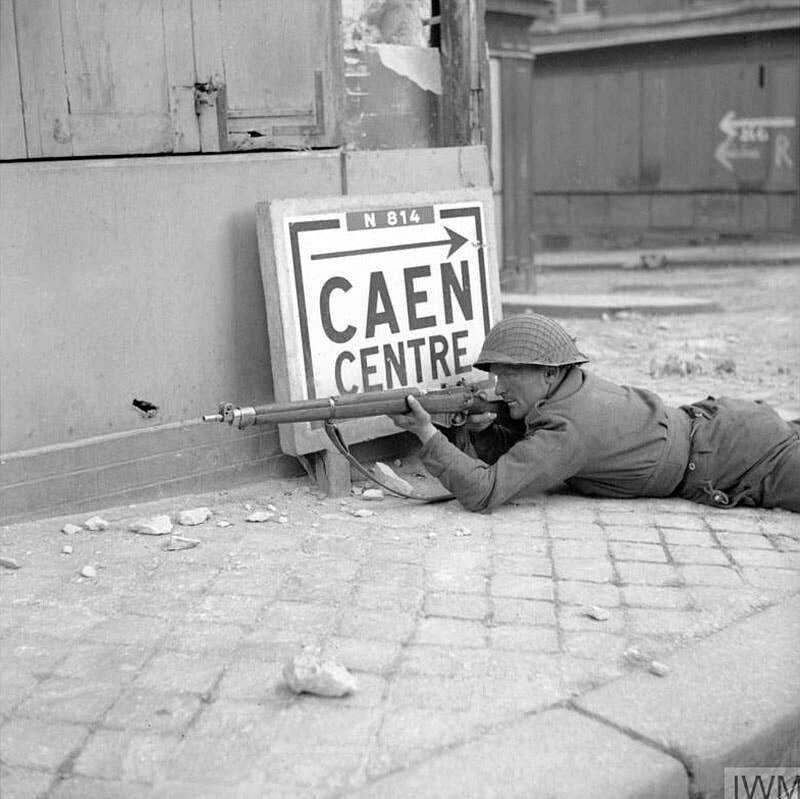 While the Normandy landings in all five sectors managed to establish footholds, many D-Day objectives were not met, including the capture of Caen and Bayeux on the first day, although British troops entered the latter city on June 7, encountering very little resistance. 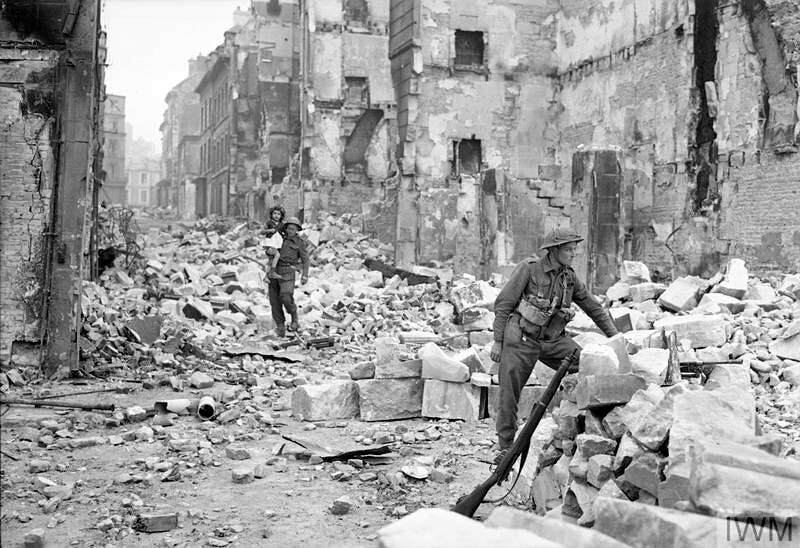 The Germans had committed most of their panzer divisions in a determined defence of Caen, and although the Anglo-Canadians launched a succession of attacks on and around the city, they found it extremely difficult to dislodge the enemy. 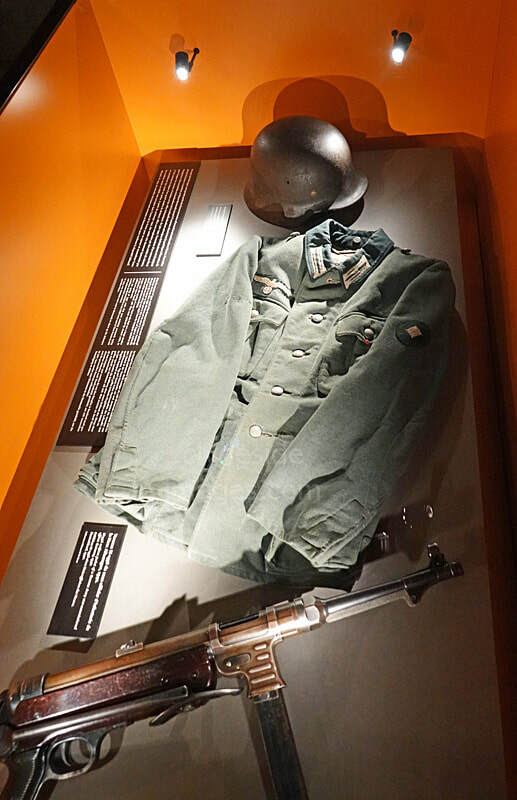 ​The fighting was mutually costly but unlike their opponents, the Germans struggled to get reinforcements to the front and had to make the most of what they had. 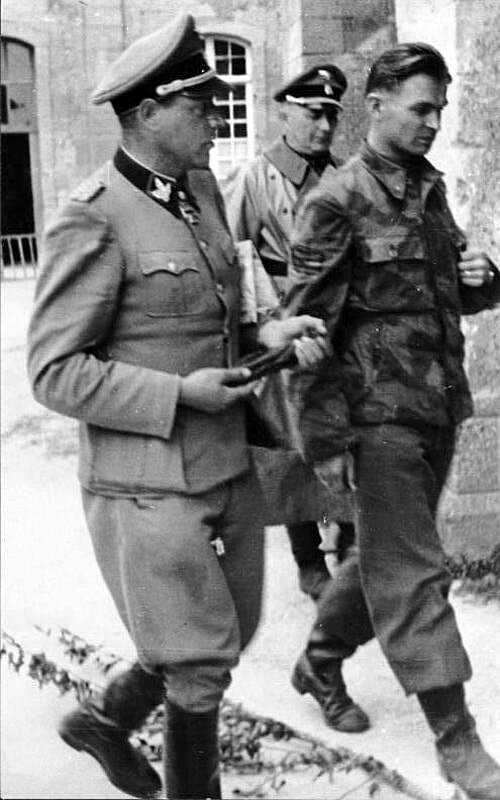 Montgomery`s promise of a breakout towards Falaise was a long time coming, but the fact that the bulk of German armour was engaged in this sector greatly assisted the Americans to the west. 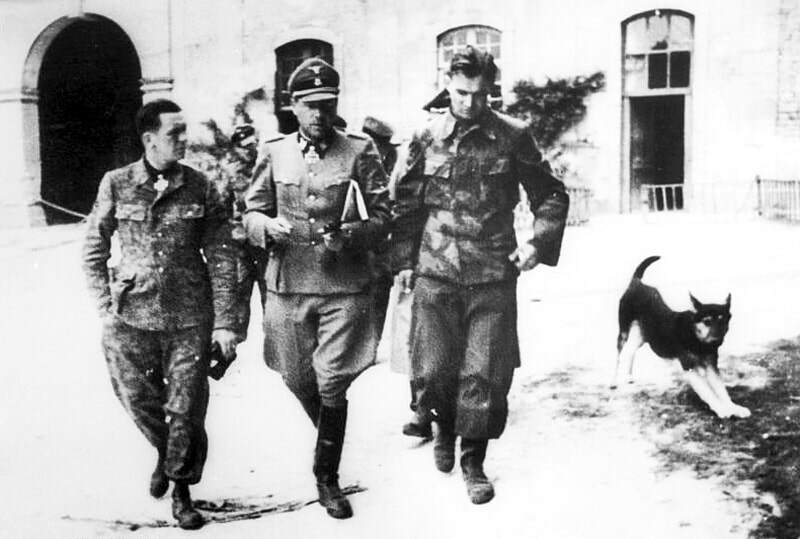 The two images above, from the Federal German Archives, show German Army commanders (and pet dog) in Caen sometime in June 1944. The suburbs and city centre north of the Orne were captured during Operation Charnwood (8–9 July). 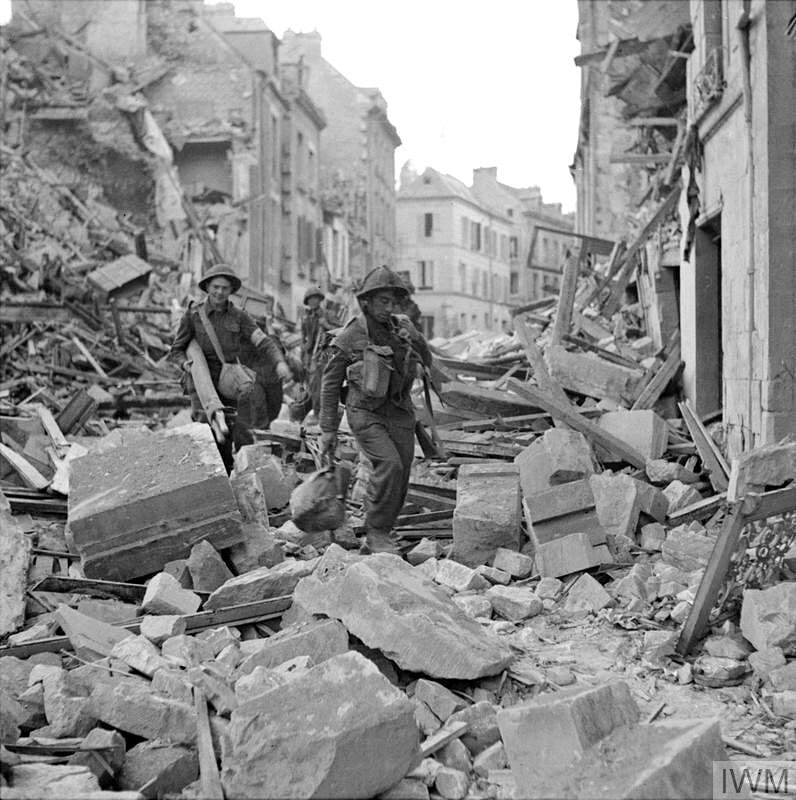 The suburbs south of the river were captured by the II Canadian Corps during Operation Atlantic (18–20 July). In western Normandy, the US First Army cut off the Cotentin Peninsula, captured Cherbourg and then attacked southwards towards Saint-Lô, about 37 mi (60 km) west of Caen, capturing the town on 19 July. 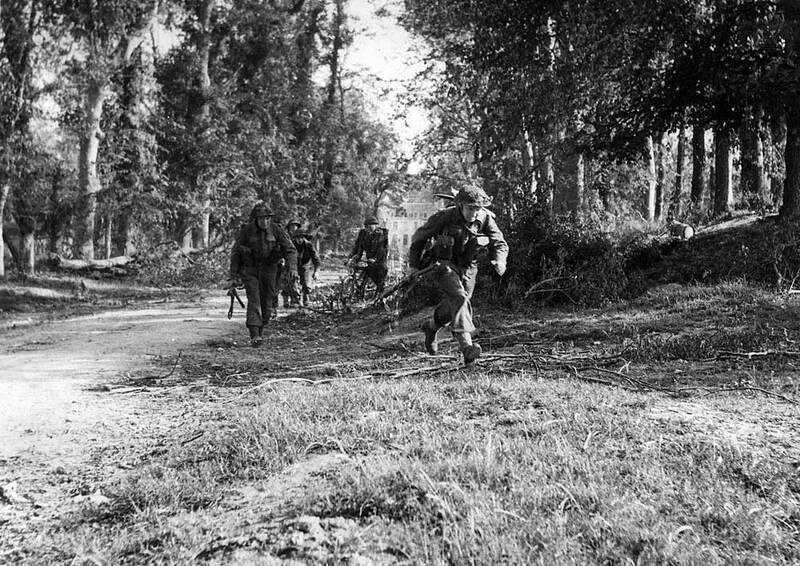 ​On 25 July after a delay caused by bad weather, the First Army began Operation Cobra on the Saint-Lô–Périers road. 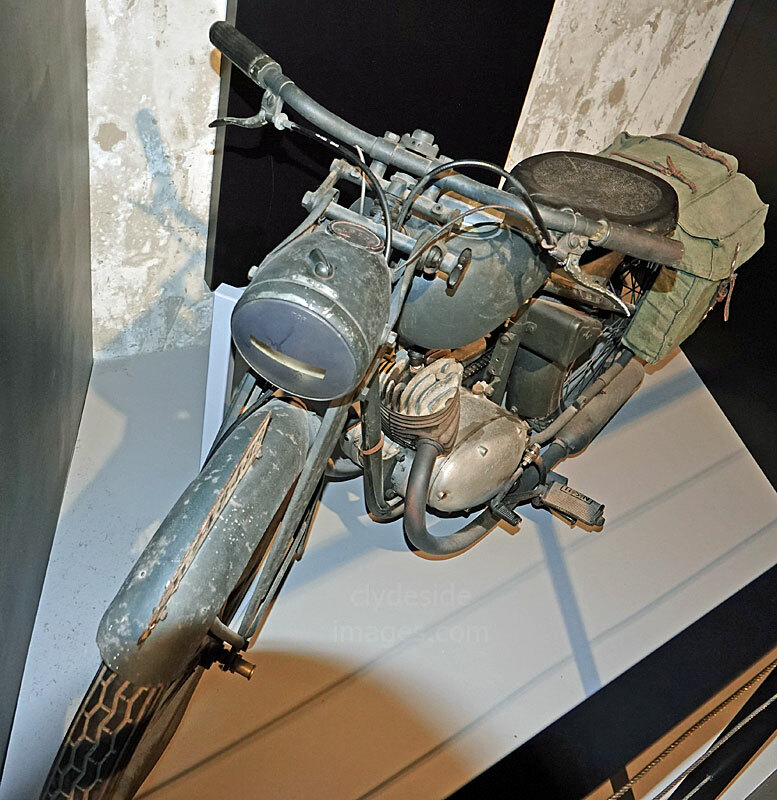 This was launched in conjunction with the Canadian offensive `Operation Spring` which attempted to take the Verrières ridge to the south of Caen. Cobra was a great success and the enemy stranglehold on Normandy began to loosen its grip. 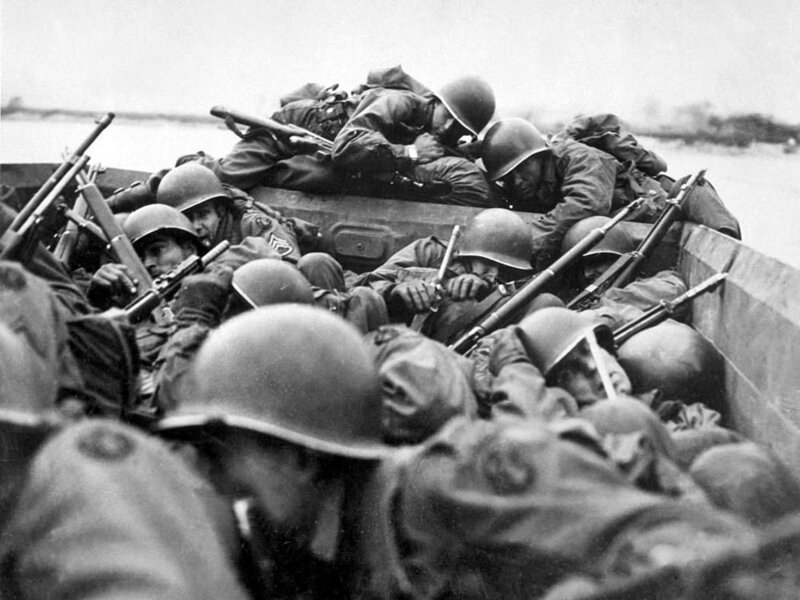 The subsequent Allied break-out at both ends of the line led to the Battle of the Falaise Pocket (12–21 August), which trapped most of the remnants of the German 7th Army and 5th Panzer Army (formerly Panzergruppe West), and thus opened the way to the Seine and Paris. 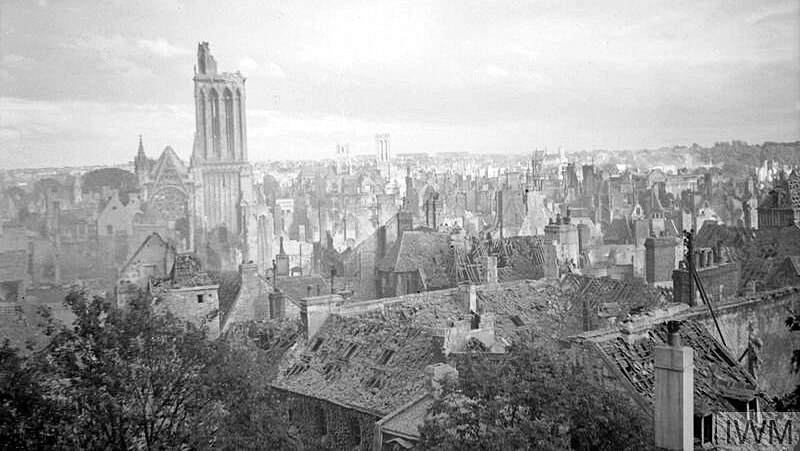 The city of Caen was destroyed by Allied bombing which did little other than provide a mass of potential strongpoints in the rubble for the enemy to use. 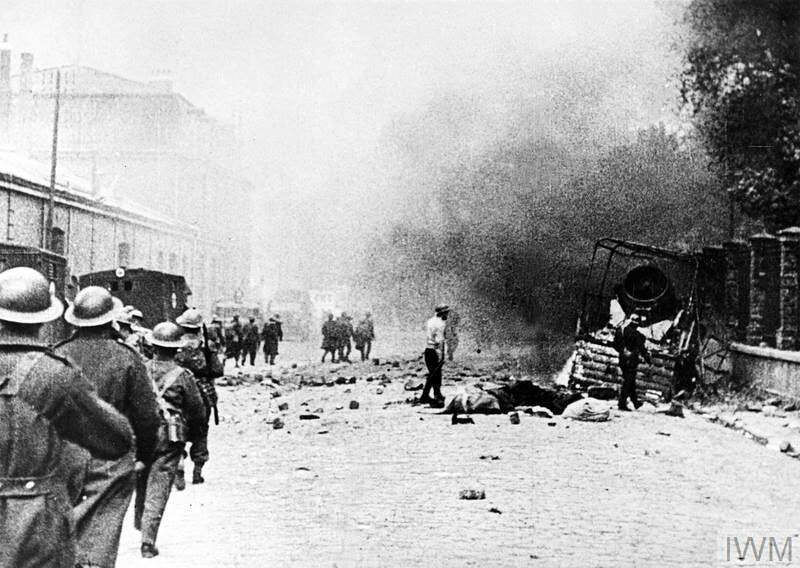 Hundreds of French civilians lost their lives and the blocked roads would only hinder the Allied advance once the city had been taken. The image above left shows North American Mitchell Mk.II, FV970 'NO-K', of No. 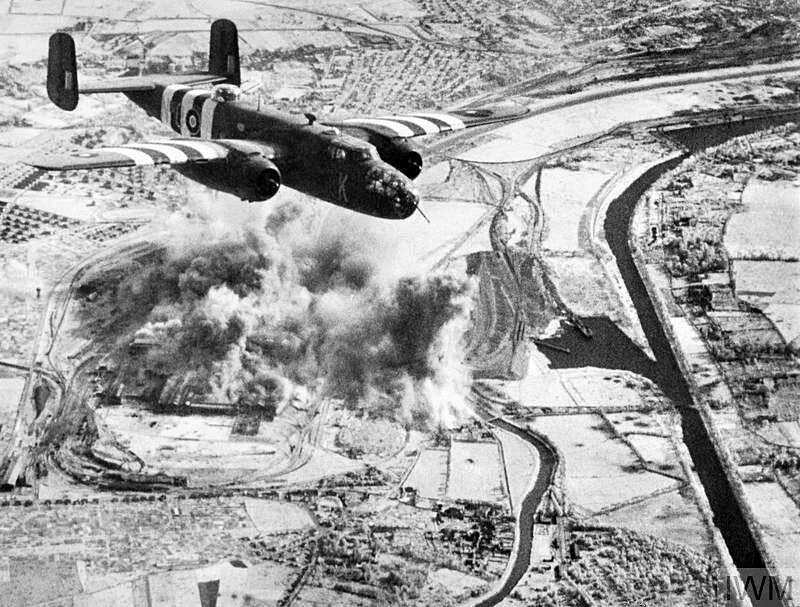 320 (Dutch) Squadron RAF flying past the smoke-enveloped Colombelles steel works, east of Caen, during a raid by No.2 Group. The Orne river and Caen Canal can be seen at right. After the battle little of the pre-war city remained and reconstruction of its buildings and infrastructure lasted until 1962. 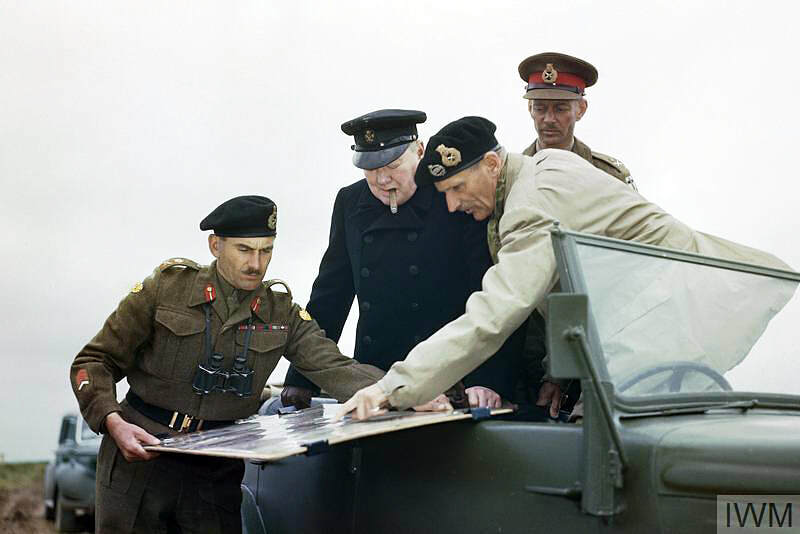 Right: General Sir Bernard Law Montgomery shows Winston Churchill the battle situation on a map held by the Commander of the 2nd Canadian Division, General G. G. Symonds, during the Prime Minister's visit to Normandy on 22 July 1944. ​The British 2nd Army Commander, Lieutenant General Sir Miles Christopher Dempsey of the British Second Army, looks on. 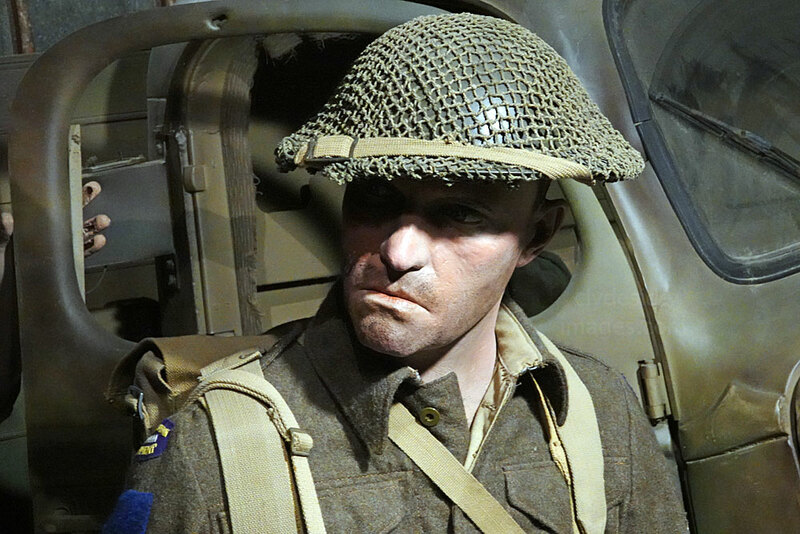 The following figure of a British soldier during the Battle for Caen is part of a diorama in the Overlord 1944 Museum at OMAHA Beach. 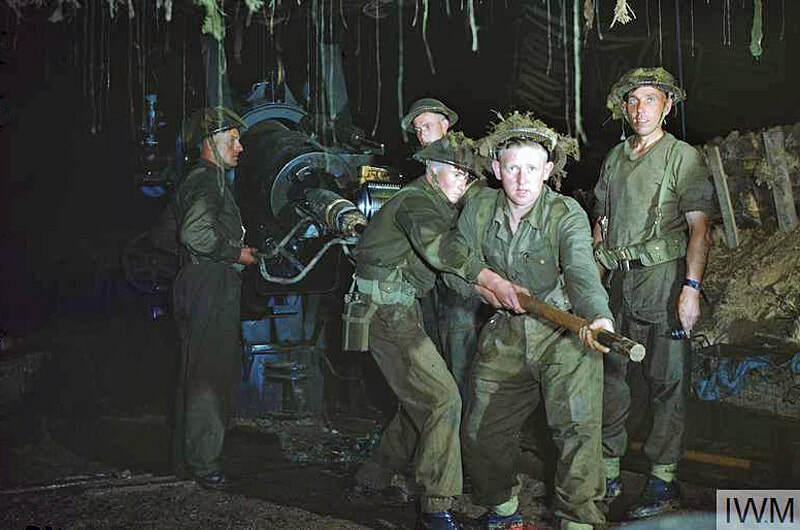 The rare colour Imperial War Museum images above show a gun crew of 53 Heavy Regiment, Royal Artillery loading a 155mm Howitzer under camouflage netting. 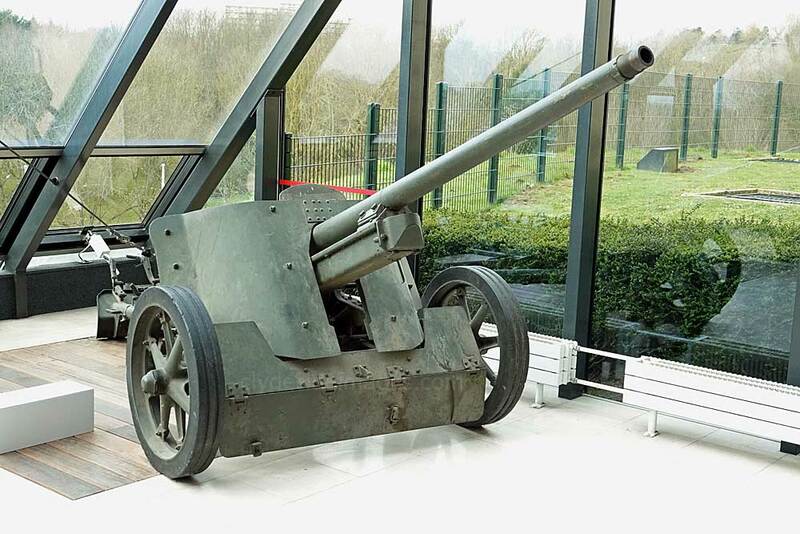 The 155mm was an American gun, often manned by British troops on the Normandy front. 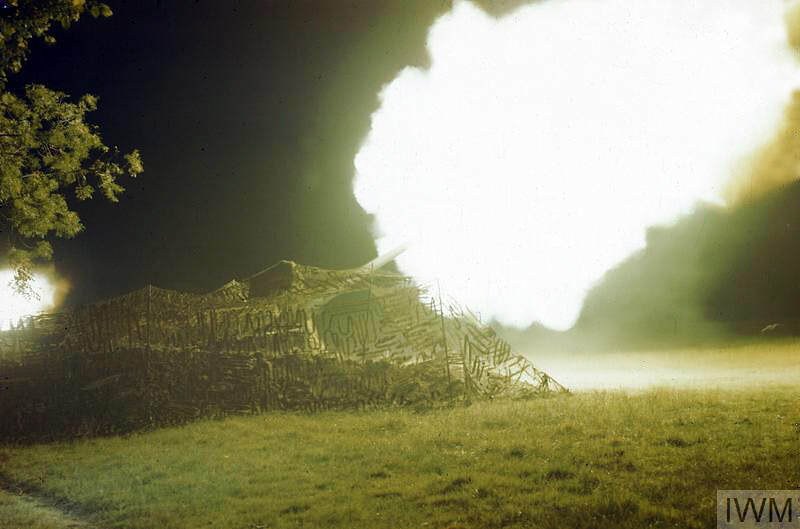 It`s estimated that over 10,000 were produced and depending on the version and ammunition used, its maximum range was 14,600 metres (16,000 yd). 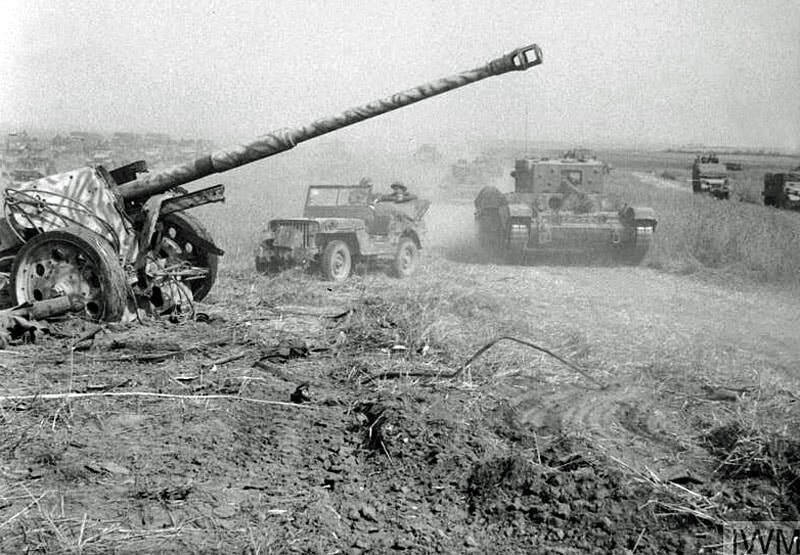 The Germans were adept at utilising their assault guns to great effect and it soon became clear to British and American commanders that attacks led by tanks were doomed to fail without proper infantry and artillery support. The armoured divisions started adapting to the new conditions by mixing tank and infantry brigades, but the successful co-ordination of the two arms was never entirely achieved by the Allies during the campaign. 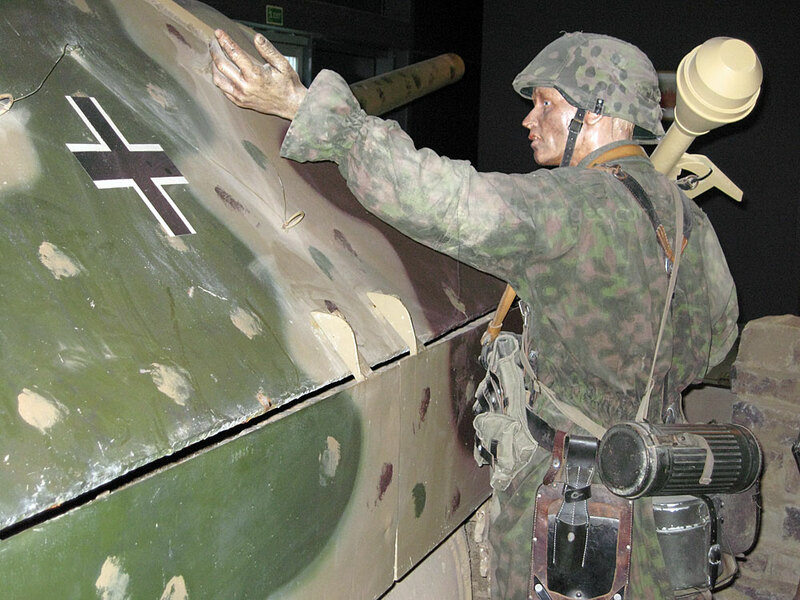 Pictured above is a Jagdpanzer 38(t) Hetzer, this particular example being on show at the Imperial War Museum, Duxford. These small Tank Destroyers were very easy to conceal and packed a powerful punch. 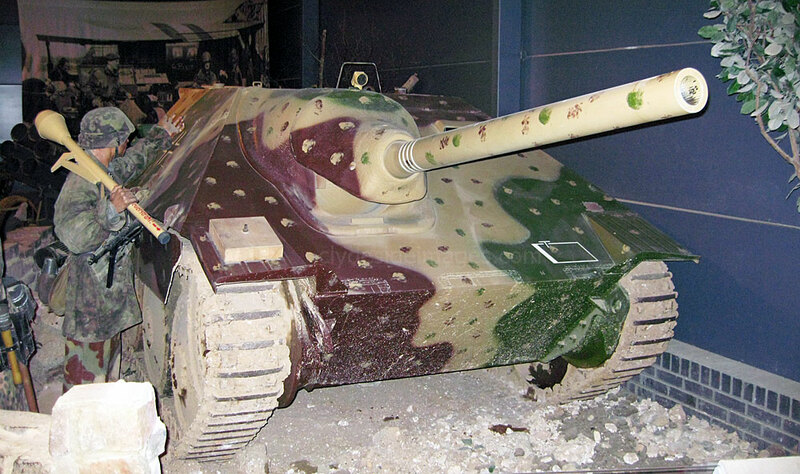 They came into service in July 1944, just a month after the D-Day landings but over 2,800 were produced, making the Hetzer one of the most common late-war German tank destroyers. 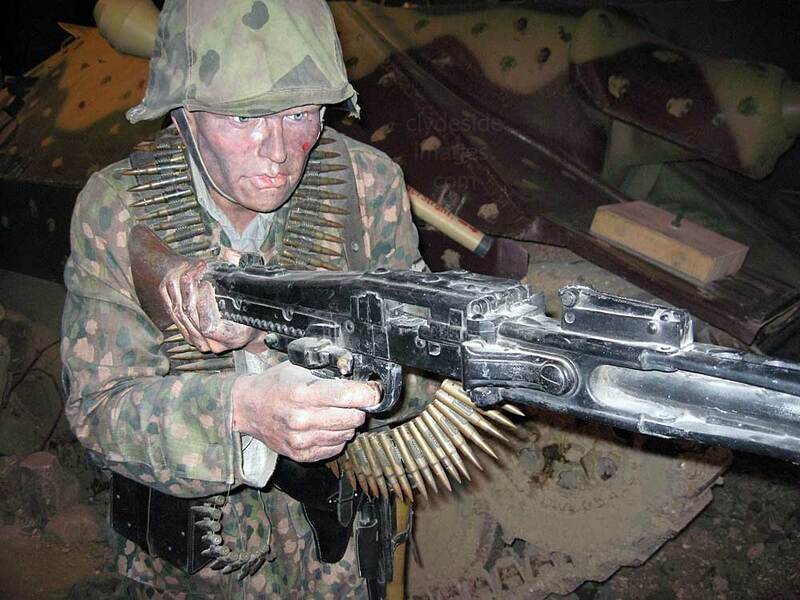 Conceived in 1935, the Sturmgeschutz (Assault Gun) was initially intended to provide mobile armoured close-support for the German infantry rather than the Panzer Troops. 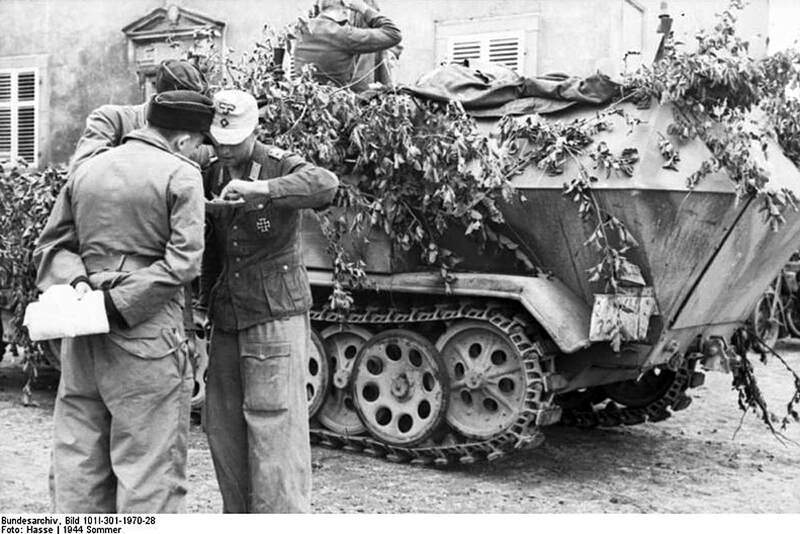 ​The Sturmgeschütz III (StuG III) was Germany's second most-produced armoured fighting vehicle during World War II after the Sd.Kfz. 251 half-track. It was built on the chassis of the proven Panzer III, replacing the turret with an armoured, fixed superstructure mounting a more powerful gun. 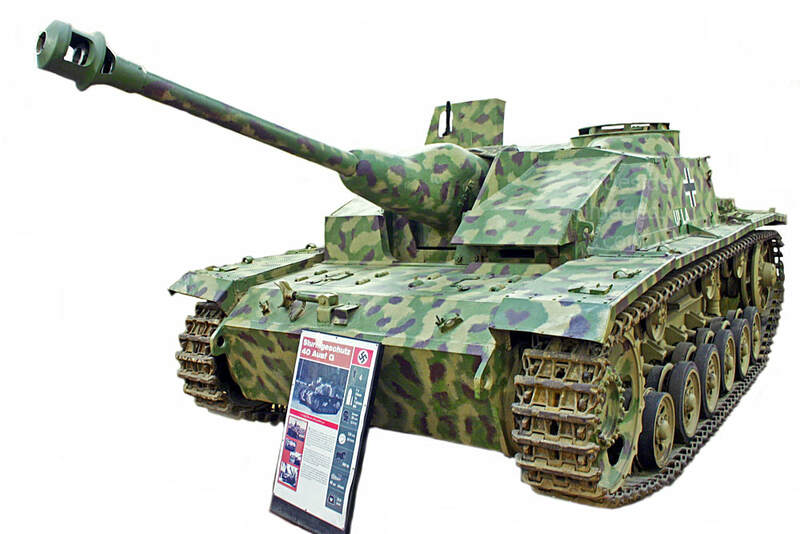 The StuG III was continually modified, and much like the later Jagdpanzer, was employed to great effect as a tank destroyer. Seven different versions were made, culminating in the Sturmgeschutz 40 Ausf G, seen here. Initially rolling off the assembly-line in December 1942, the Ausf G was produced until the end of the war with no major design changes. Seizing control of Carpiquet Airfield, located on high ground outside Caen, was a priority, however, the German defence was particularity stubborn resulting in large numbers of casualties on both sides. 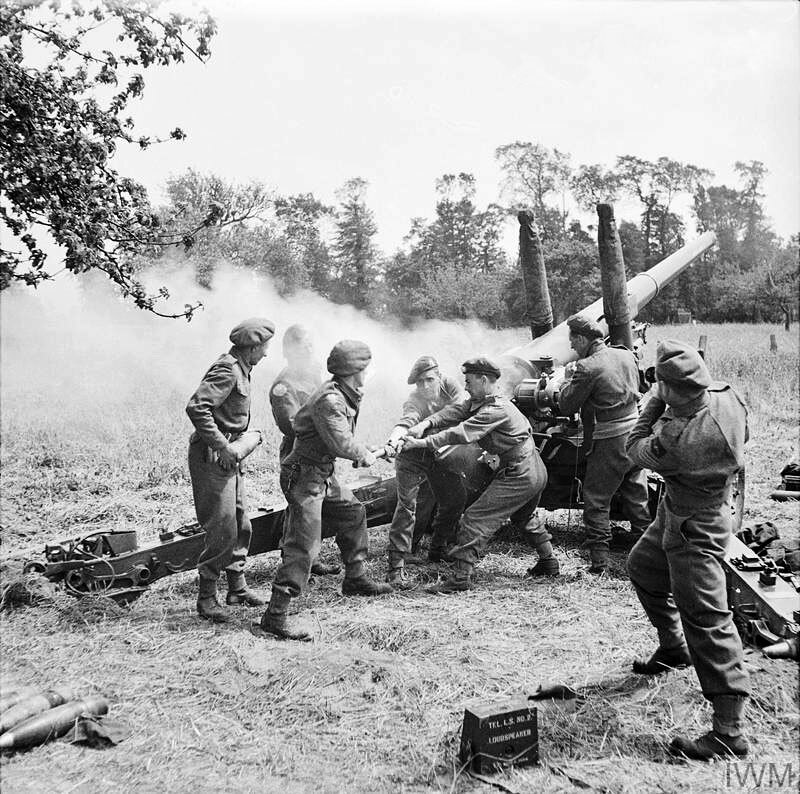 The Canadians made the attack as part of Operation Windsor (4–5 July 1944) and Carpiquet village was in Allied hands by mid-afternoon on the 4th but two attacks on the airfield itself failed, despite significant tank and air support. Next day the Canadians fought off a succession of German counterattacks. 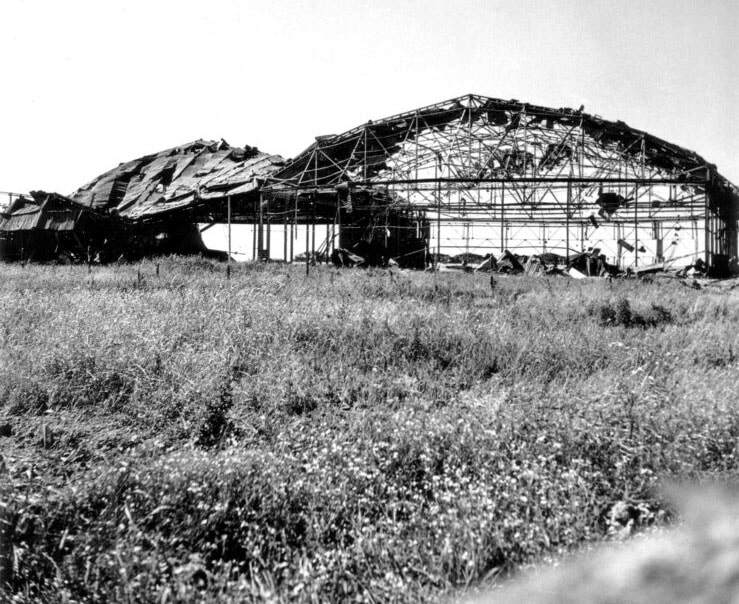 The airfield was finally captured on 9 July. 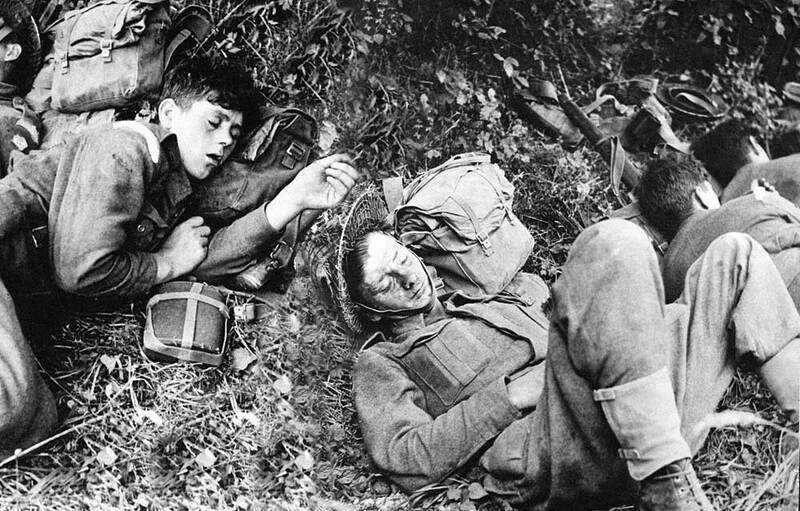 Exhausted Canadian troops near Caen. The youth of these soldiers is immediately apparent. Above: The clear-up at Carpiquet airfield is about to begin. 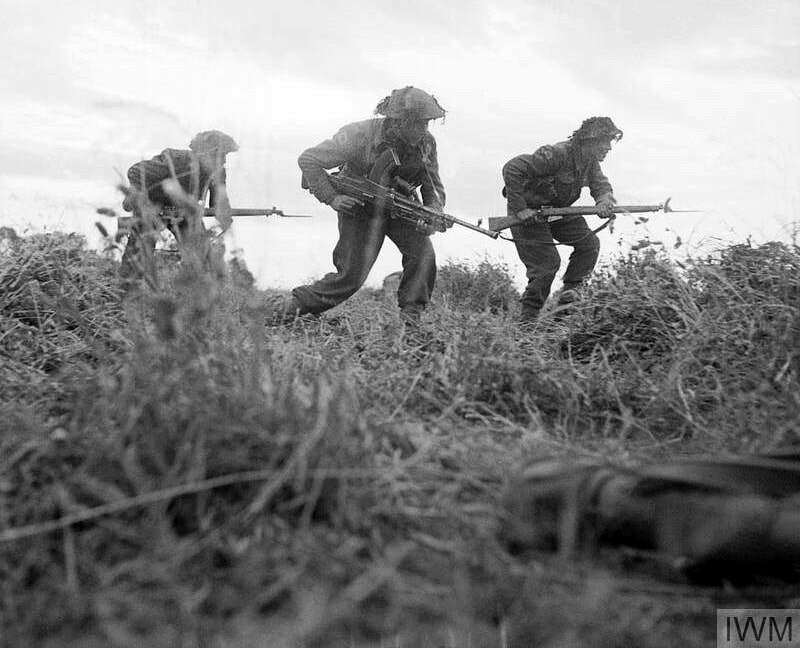 ​Operation Totalize which ran from 8 to 9 August 1944, saw forces of Great Britain, Canada and Poland break through the German front lines and advance towards Falaise, however, having progressed 9 miles (14 km) the Allies were halted 7 miles (11 km) north of their intended positions. 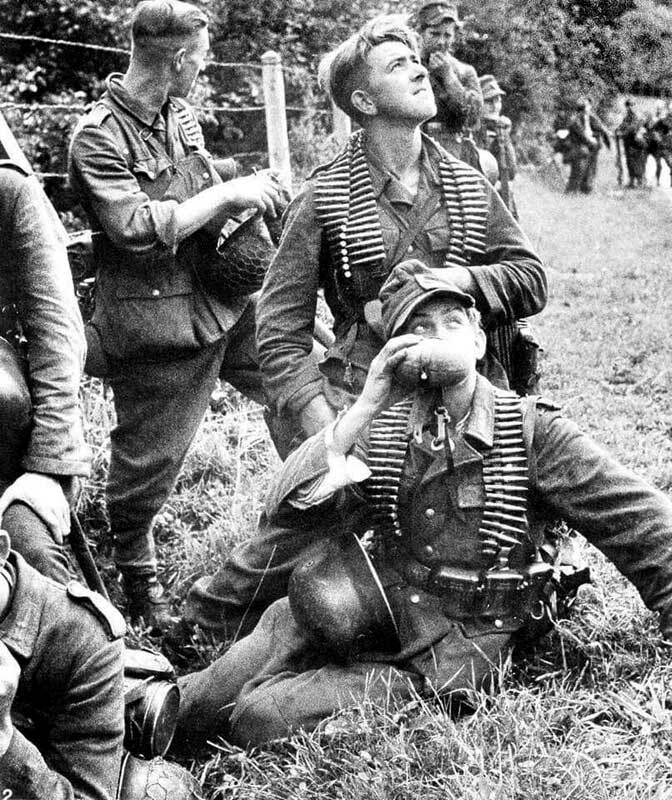 The already badly depleted Germans suffered upwards of 1,500 casualties. 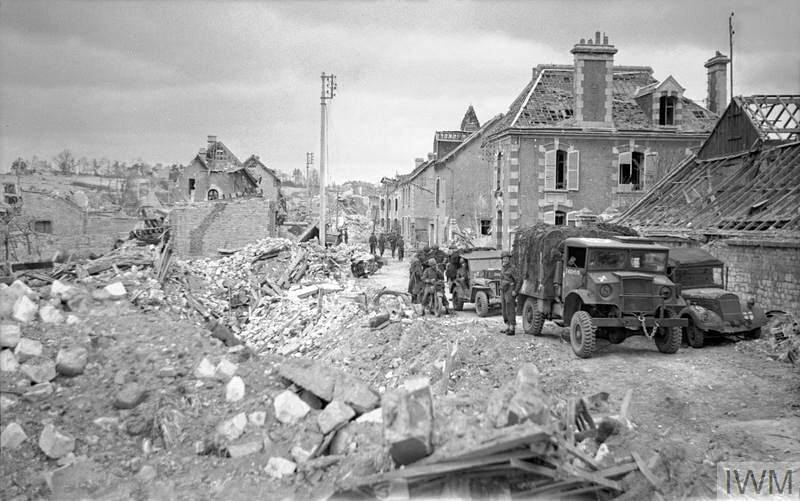 A follow-up offensive, Operation Tractable, was mounted and ran from 14 to 21 August when Canadian and Polish units made contact with US troops to the south, thus sealing the neck of the Falaise Pocket, trapping thousands of German troops and ending Commonwealth participation in the Battle of Normandy. 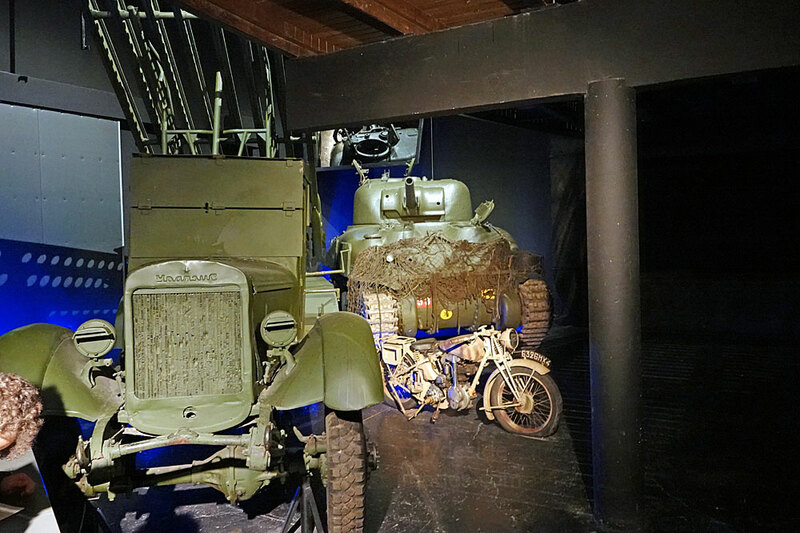 More information on Totalize and Tractable, and the other operations mounted by the British, American and Canadian armies during the campaign, can be found on my Battle of Normandy main page which features numerous historical photographs as well as some from my own collection. The Avro Lancaster is one of the most famous RAF aircraft of all time, best known for carrying out the Dambuster Raids in 1943, which saw 19 of these aircraft attack German dams with 'bouncing bombs' developed by Sir Barnes Wallis. 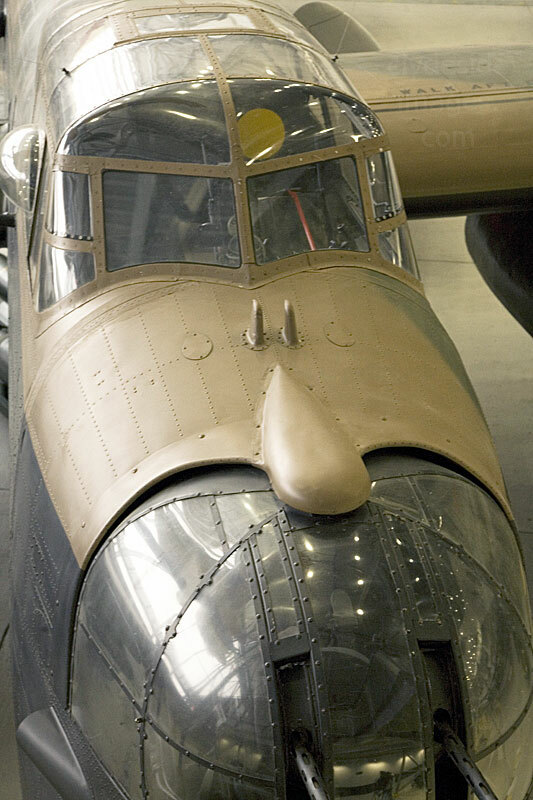 The Lanc was also among the heavy bomber types used extensively throughout the Normandy Campaign. More than 7,377 Lancasters, 430 of which were built in Canada under licence, were produced during the Second World War. Right: Lancasters carpet bomb a road junction near Villers-Bocage, Normandy, through which the 2nd and 9th SS Panzer Divisions were expected to move to carry out an attack on the junction of the British and American armies. 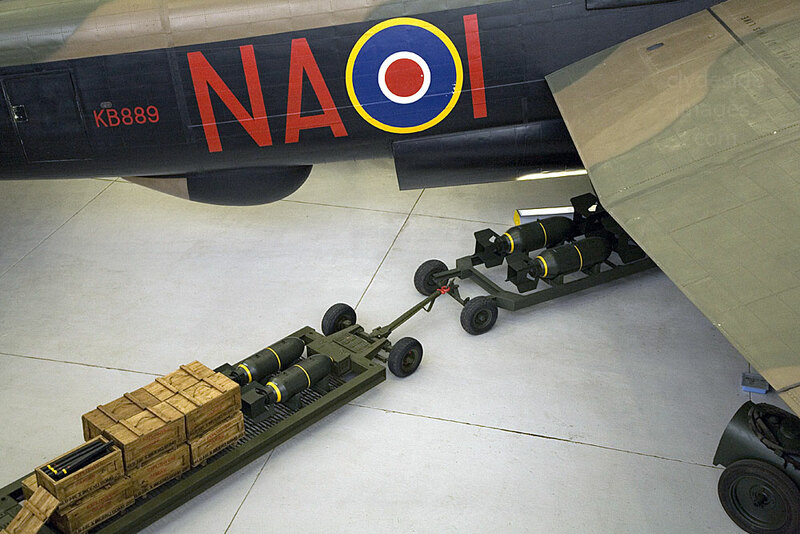 This daylight attack, by 266 aircraft of Nos.3, 4 and 8 Groups, was carried out at 4,000 feet to ensure that the target indicators dropped by the Pathfinders were seen and 1,100 tons of bombs were dropped with great accuracy. Above: Avro Lancasters of No. 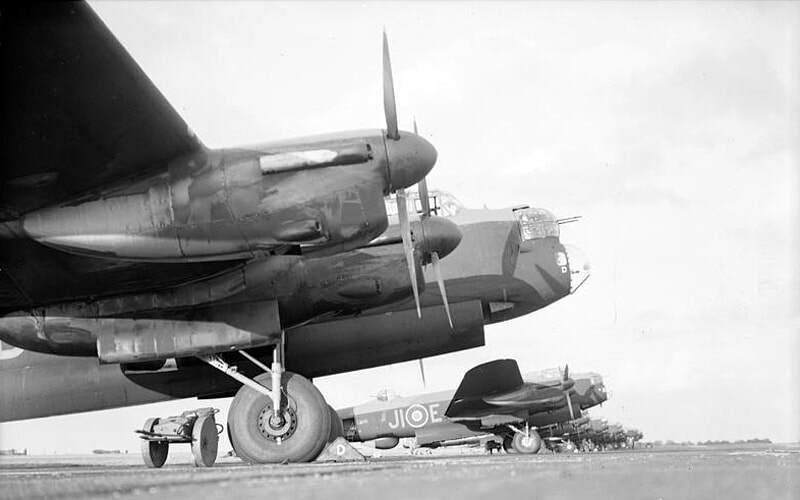 514 Squadron RAF, lined up at Waterbeach, Cambridgeshire, before taking part in a daylight attack on fortified villages east of Caen, in support of the Second Army's armoured offensive during Operation Goodwood (18 - 20 July 1944). 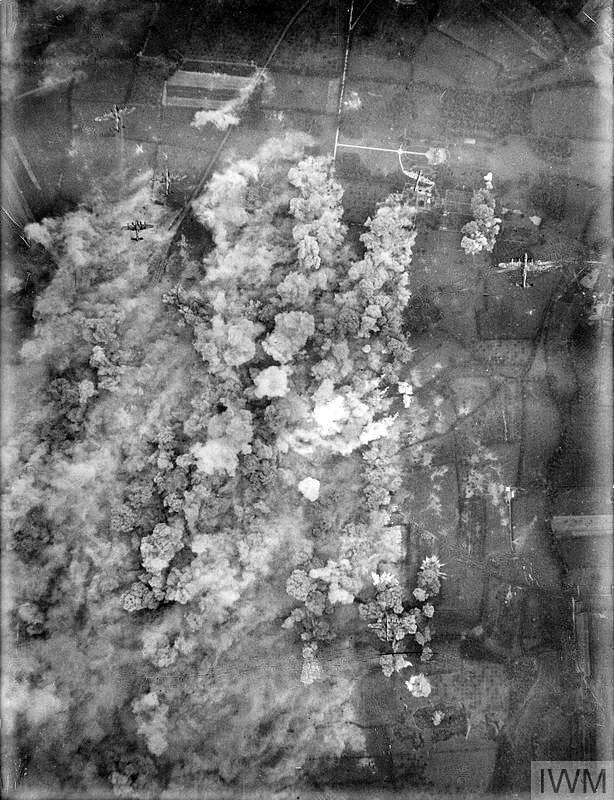 This aerial reconnaissance photograph, taken from 24,000 feet, shows the St Jean district of Caen, which was destroyed by two heavy raids on the city by aircraft of No. 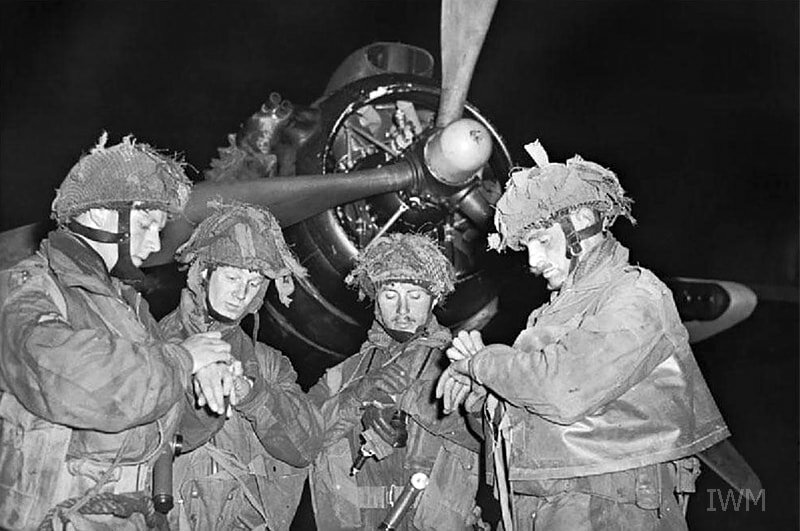 5 Group, Bomber Command, on the nights of 6/7 and 12/13 June 1944. The Bassin Saint-Pierre is at bottom left and the River Orne flows from upper right to middle left. The church of St Jean, damaged but still standing, is visible towards the middle of the lower-right quarter of the photograph. Another badly damaged area can be seen across the river in the Vaucelles district, to the right of the main railway station (top left). 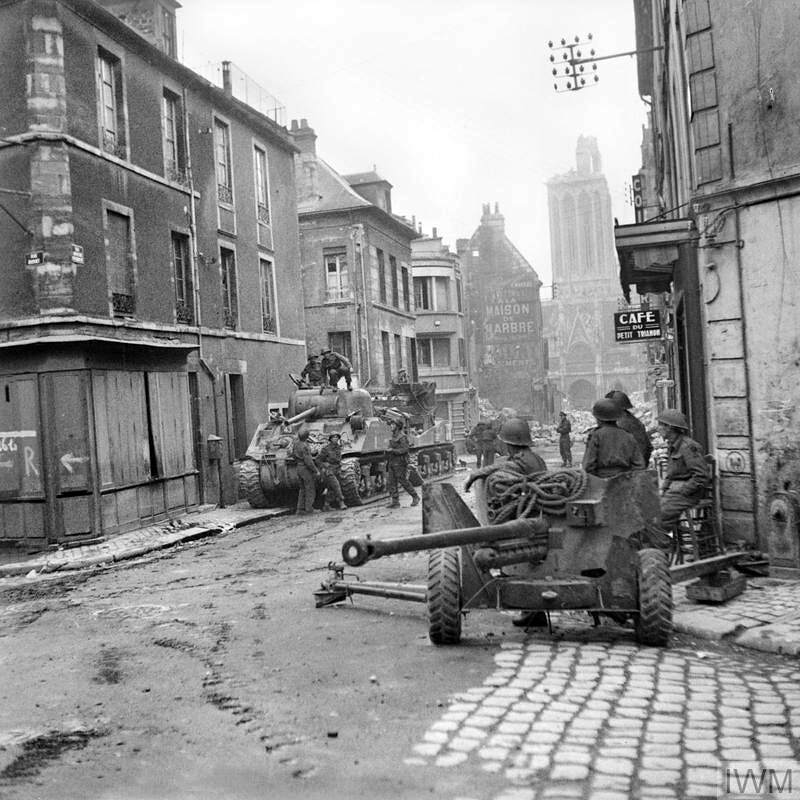 British forces including Sherman tanks and a 6-pdr anti-tank gun in the centre of Caen, on or about 10 July 1944. 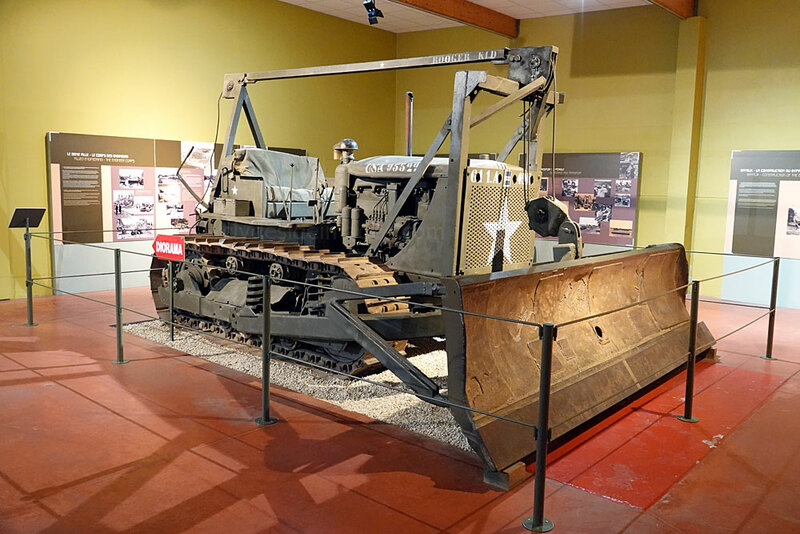 ​This Caterpillar D7 Bulldozer `Booger Kid`, on display at the Battle of Normandy Memorial Museum (Musée Mémorial Bataille de Normandie) landed in July 1944 and was quickly put to use by Canadian engineers in clearing rubble in the ruins of Caen. 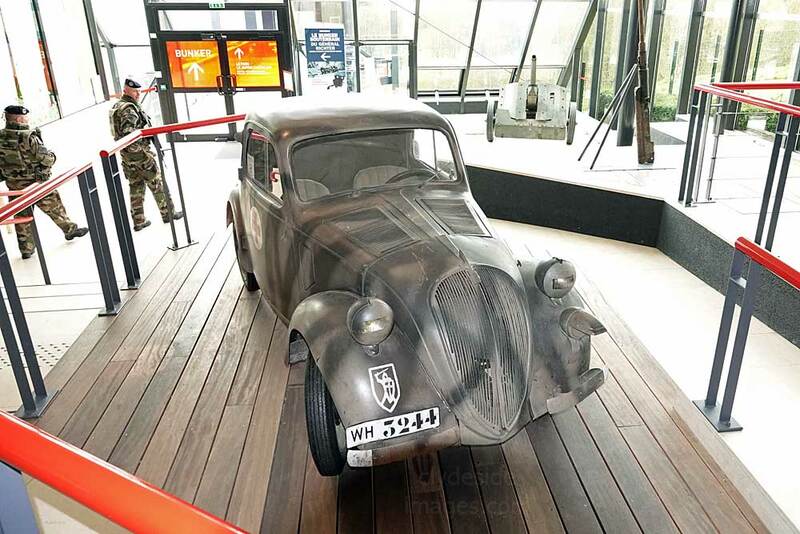 ​After the War, the dozer was purchased by the company that operated the quarries in Feuguerolles, a village situated a few kilometres from the city, where it gave faithful service until 1984. 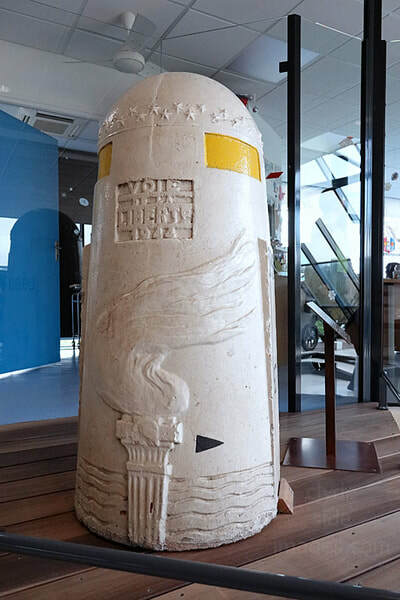 It was traded-in for an up-to-date machine and its new owners presented it to the City of Bayeux in recognition of the vital and often dangerous work done by Allied engineering units. 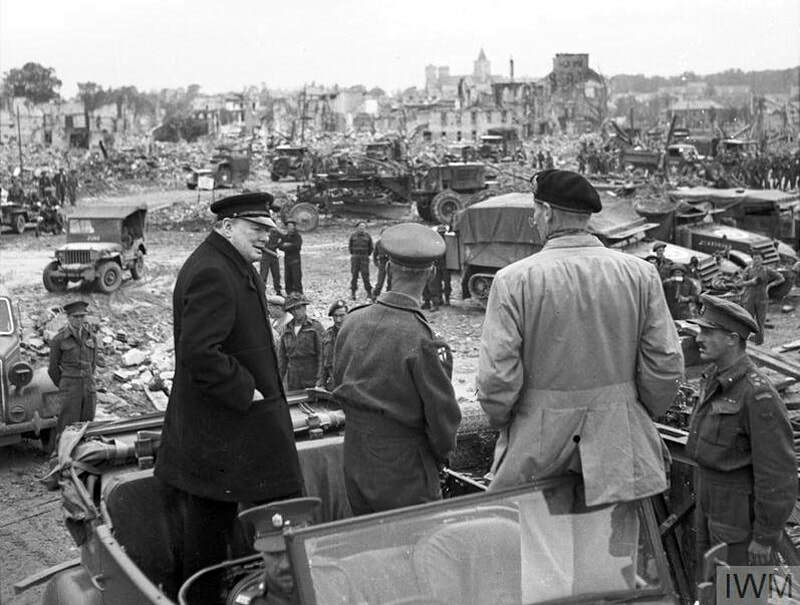 Right: Prime Minister Winston Churchill surveys the devastation in Caen along with General Sir Bernard Montgomery and Lieutenant General Sir Miles Dempsey on 22 July 1944. 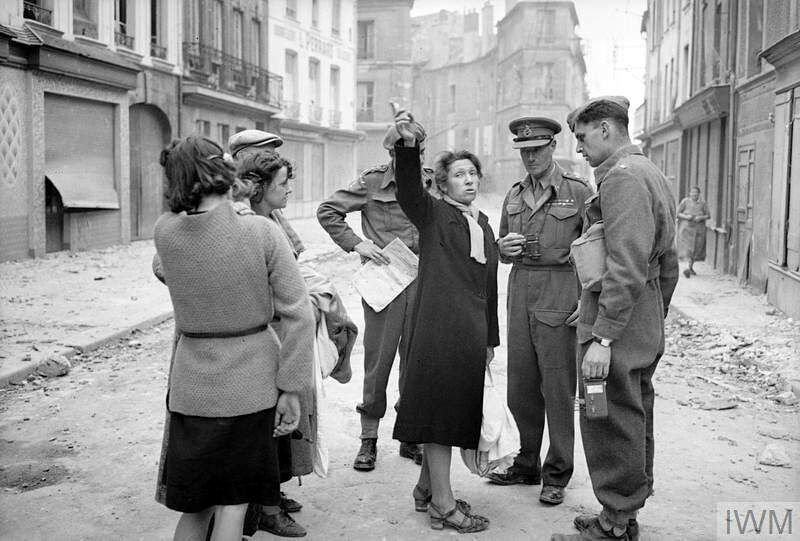 Above left: Lieutenant General J. T. Crocker, 1st Corps Commander, talking to some of the liberated civilians during a tour of the city. 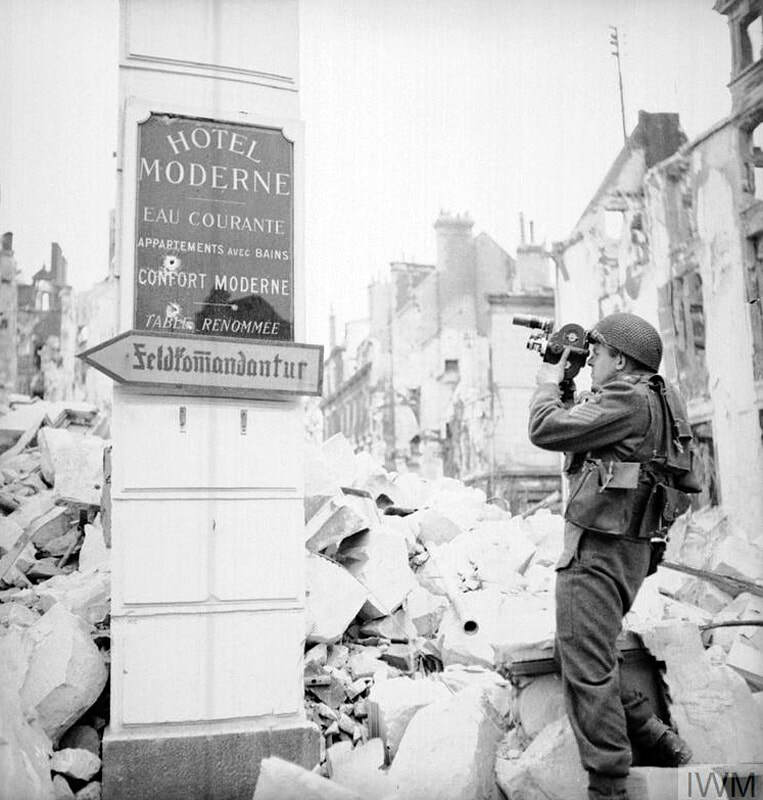 The other photo shows AFPU (Army Film and Photographic Unit) cameraman Sergeant J. H. Goddard using a turret-lensed Eyemo camera to film a German military direction sign attached to the only part of Caen`s Hotel Moderne left standing. 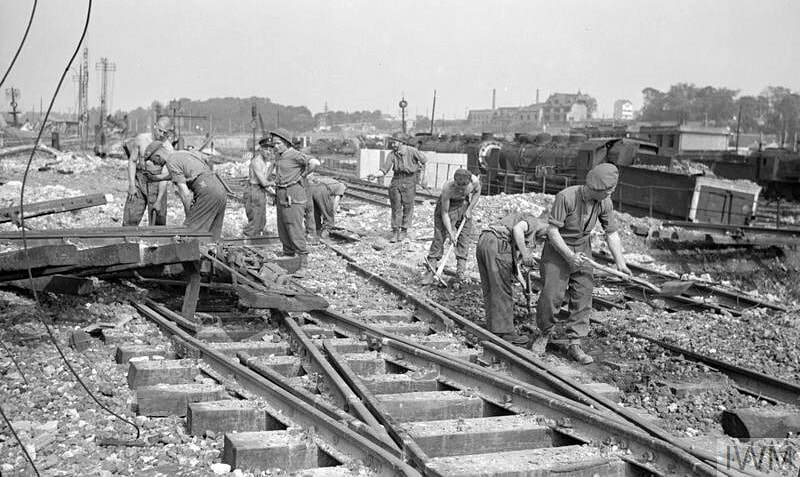 Above right: ​Royal Engineers help to repair track at the railway yard in Caen on 24 July 1944. 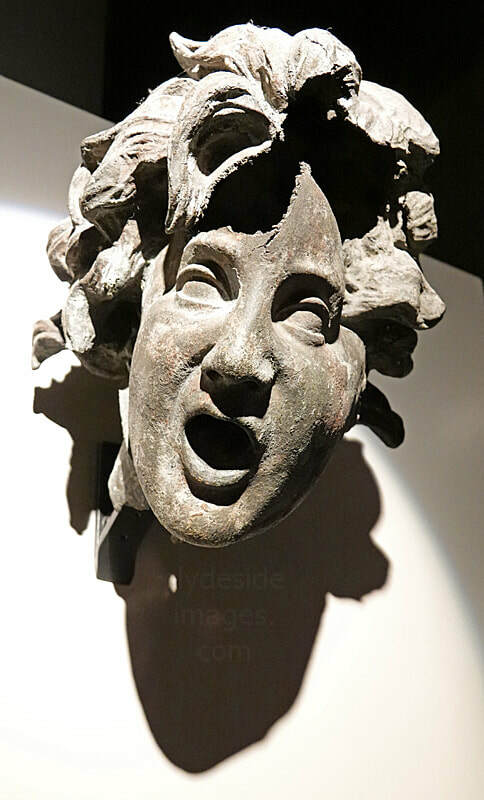 The bronze head, now on display at the Caen Memorial, was knocked out of shape by an exploding Allied bomb and found in the ruins of the city. 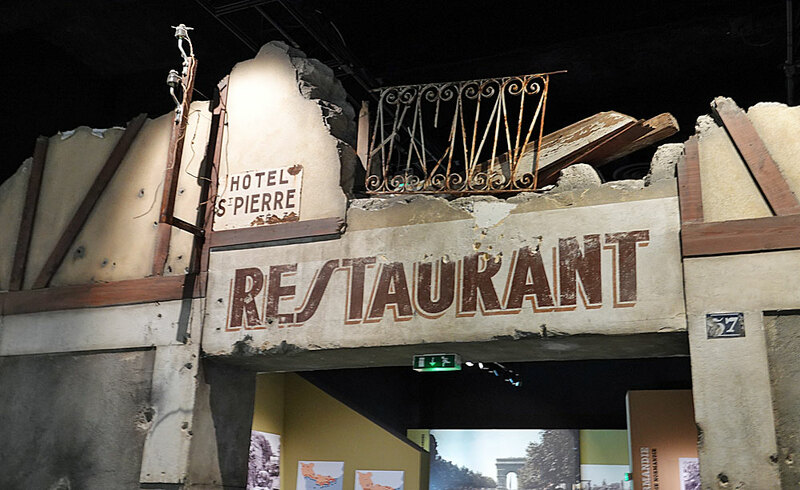 By the end of August, Caen, having suffered countless aerial and naval bombardments and endless artillery shelling, like many other towns in lower Normandy had paid a heavy price for Liberation. 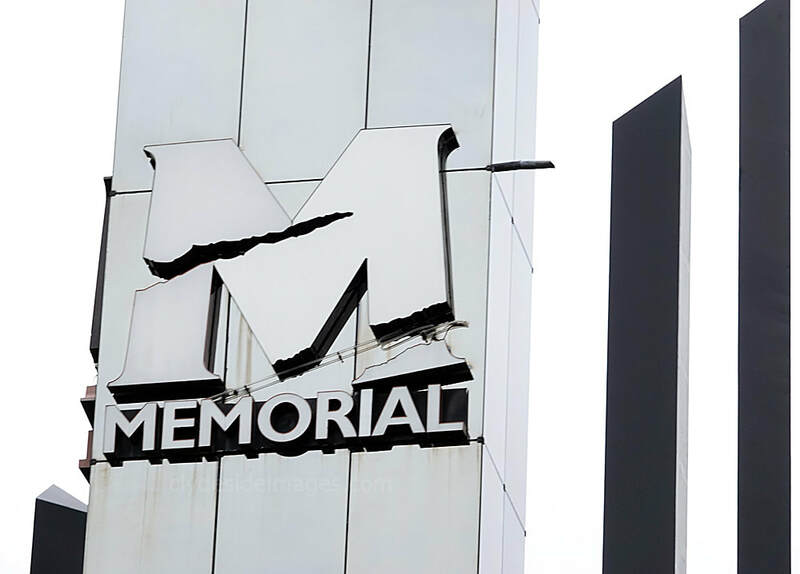 Over 2,000 civilians had been killed in the regional capital, and over 70 percent of the city lay in ruins, including many of the city`s historic buildings and monuments. 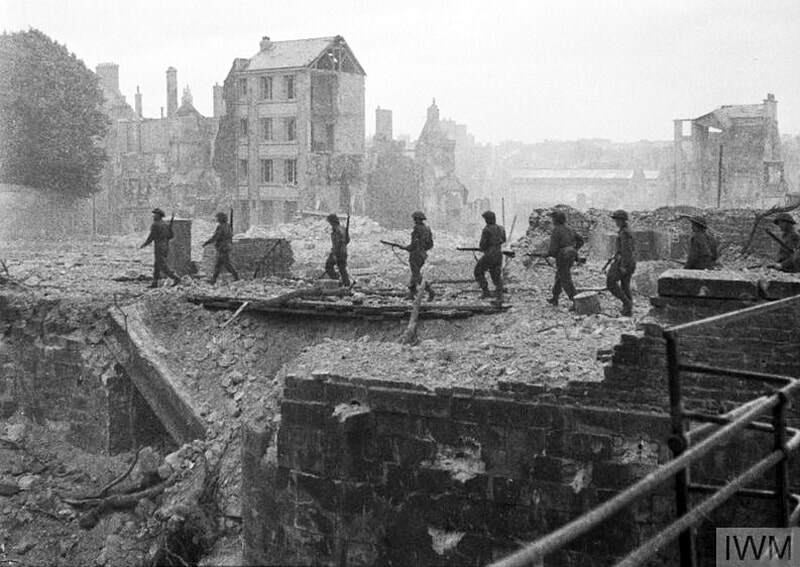 The bombing of Caen remains one of the most controversial episodes in the entire Normandy Campaign. 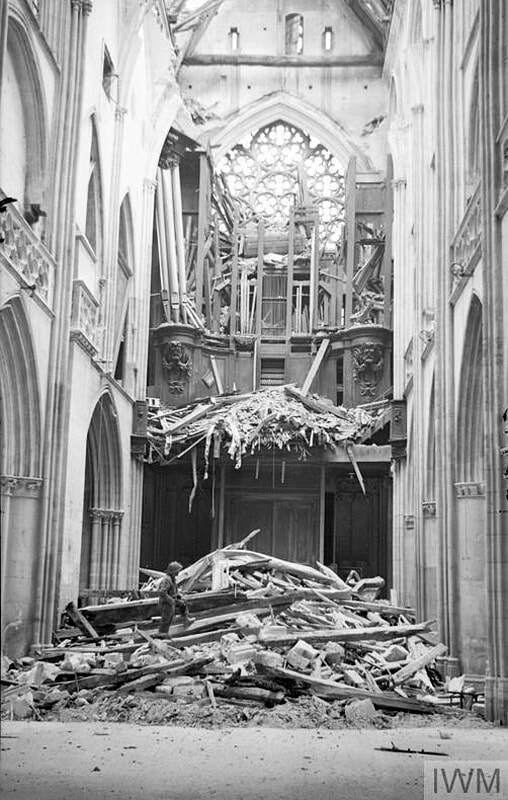 ​Above: Interior view of the Church of Saint-Pierre in Caen showing the damaged organ, 10 July 1944. 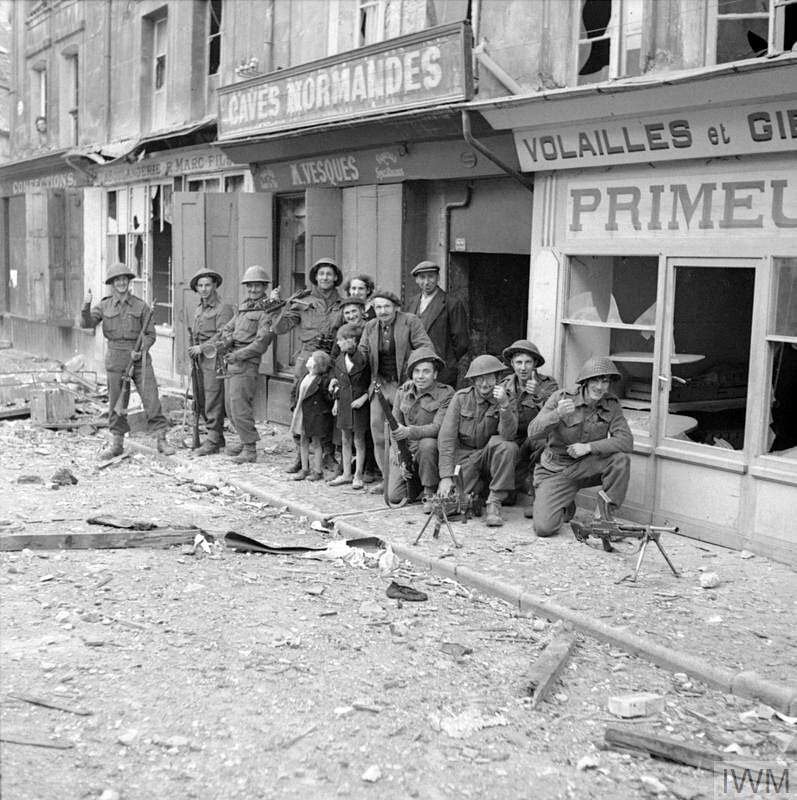 Some of the first troops to enter the city pose with local inhabitants outside wrecked shops, 9 July 1944. 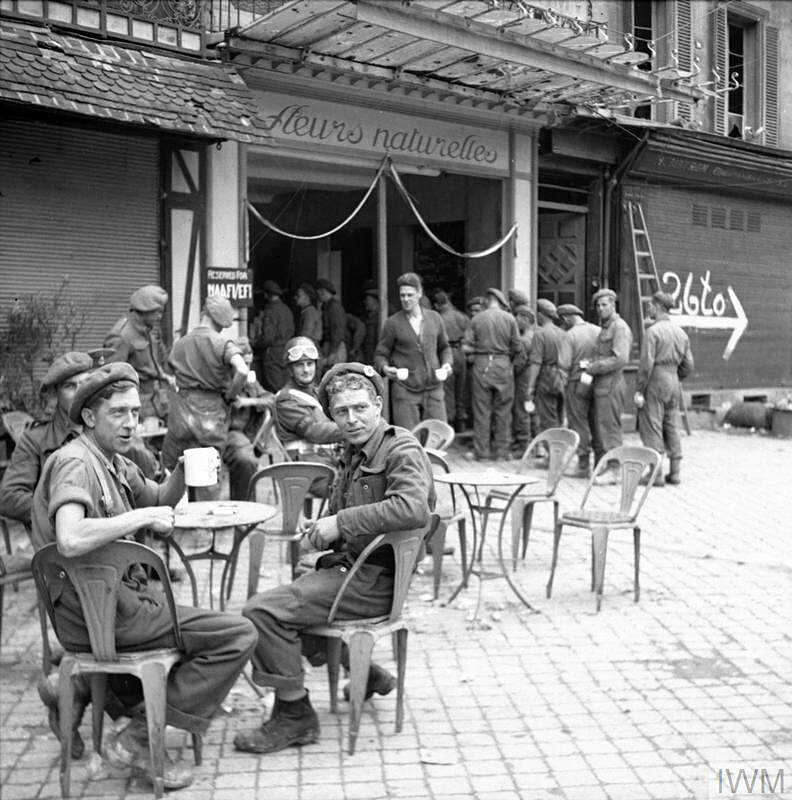 The other scene above was taken outside the NAAFI in Caen almost a fortnight later. 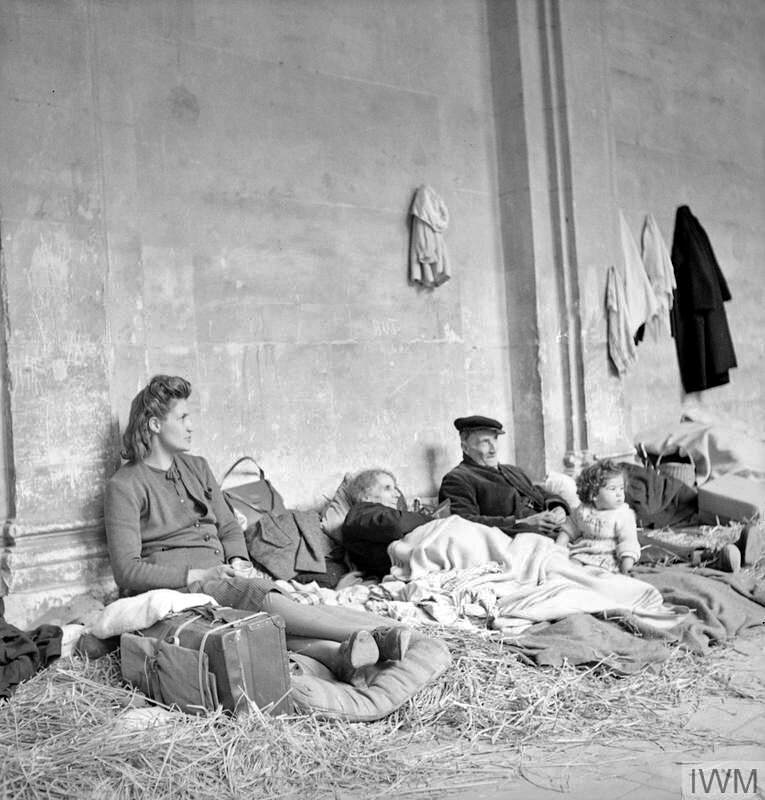 Many of Caen`s citizens had sought refuge in the city`s cathedral during the bombing while hundreds of others sheltered for weeks in a massive cave on the outskirts. 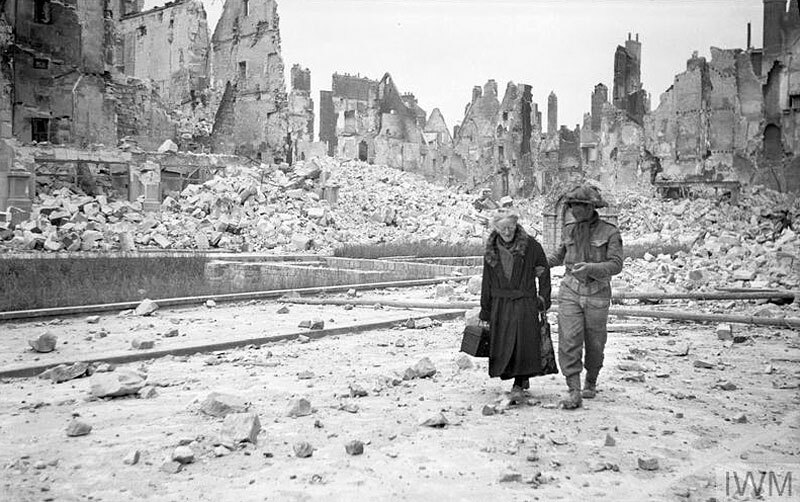 German POWs being marched through the ruined city after its capture by Allied forces. The Mémorial de Caen is both a war memorial and a museum. 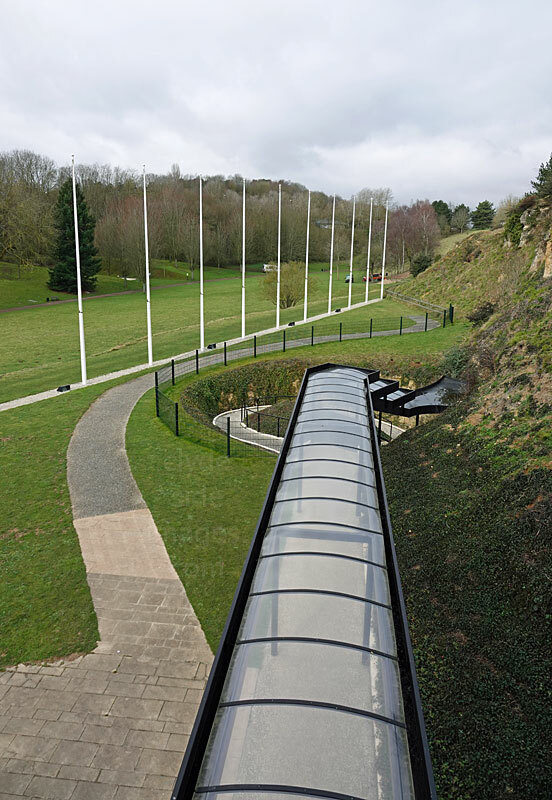 The buildings and grounds occupy the site of an old underground bunker system used by the Germans during WW2 and a command bunker has been preserved and forms part of the museum. The flags of the main nations involved in the Battle of Normandy usually fly from the flagpoles in front of the main entrance building. 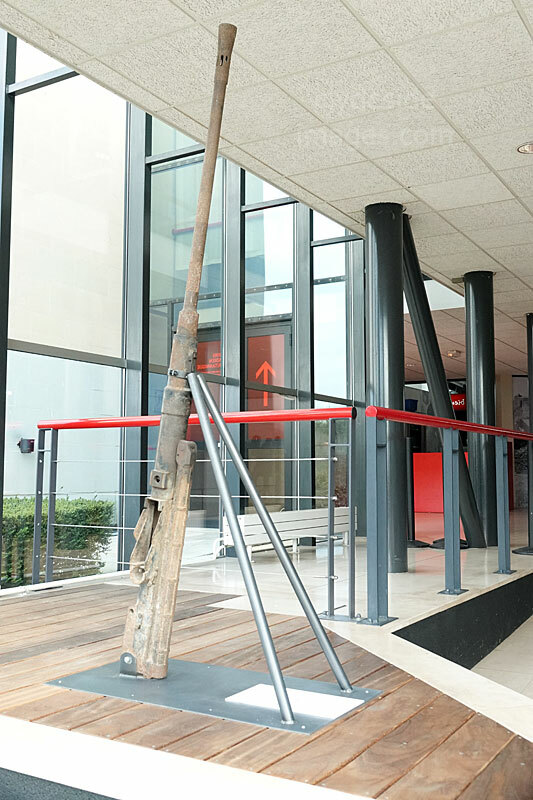 The museum was officially opened on June 6, 1988 (the 44th anniversary of D-Day) by the then French President François Mitterrand. Access to the bunker system is via a door at the back of the foyer. The way leads across a Bailey Bridge, followed by a descent to the bottom of the slope where the entrance is located. 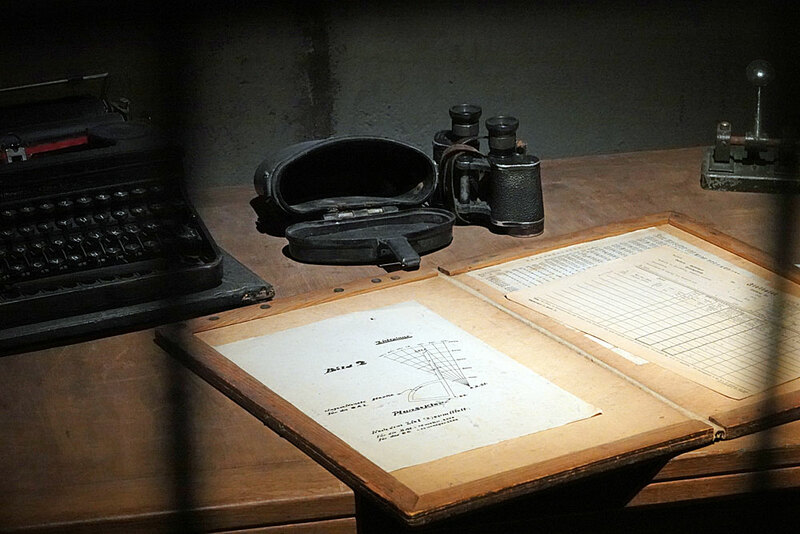 The bunker was the Headquarters of German General Wilhelm Richter who was in charge of defending the Calvados beaches in 1944. 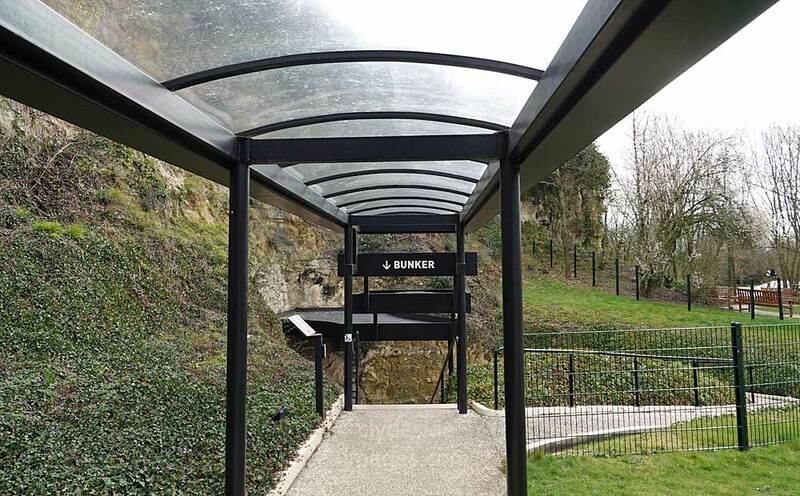 Located 15 km from the coast, the Headquarters of the 716th Infantry Division comprised a 70 metre-long tunnel connected to three staggered access corridors. Outside, camouflage netting screened the entrances from aerial observation. The main gallery, hewn out of the rock and reinforced with concrete, was partitioned into twelve sections, all of which were linked with General Richter`s office in the centre. 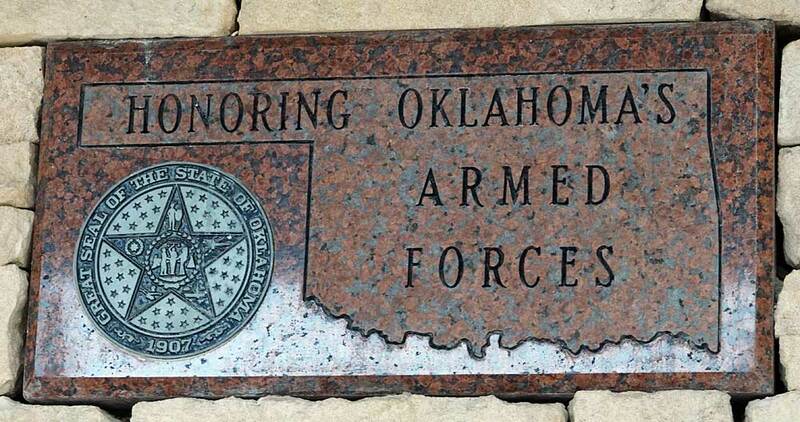 On either side were HQ staff for engineering, artillery, transport and radio communications. There was also a kitchen and a sick bay. The following plan of the site is on display within the actual bunker. 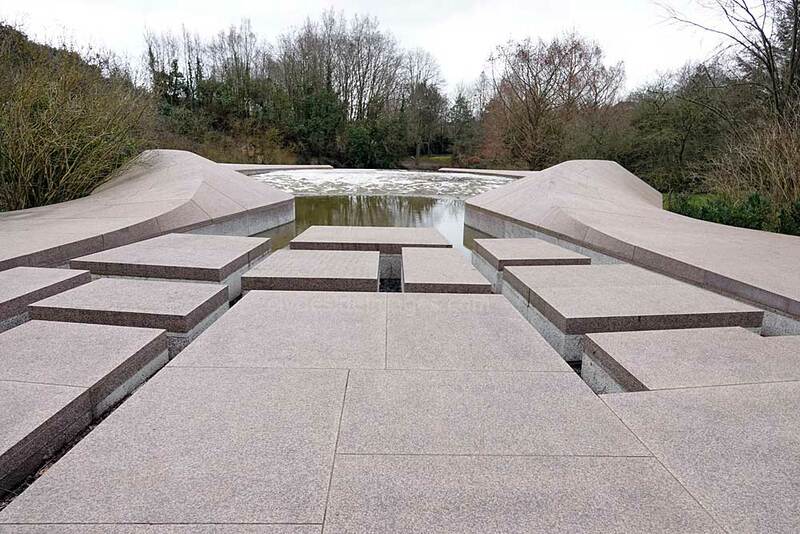 The Caen Memorial is dedicated to the history of violence and major conflict in the 20th Century with particular emphasis on World War II. 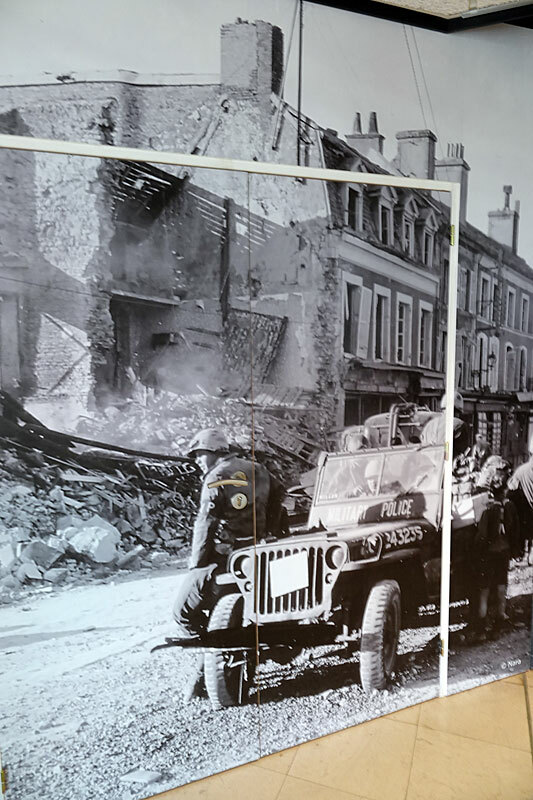 The original building deals with the lead up to the Second World War and the events that took place. 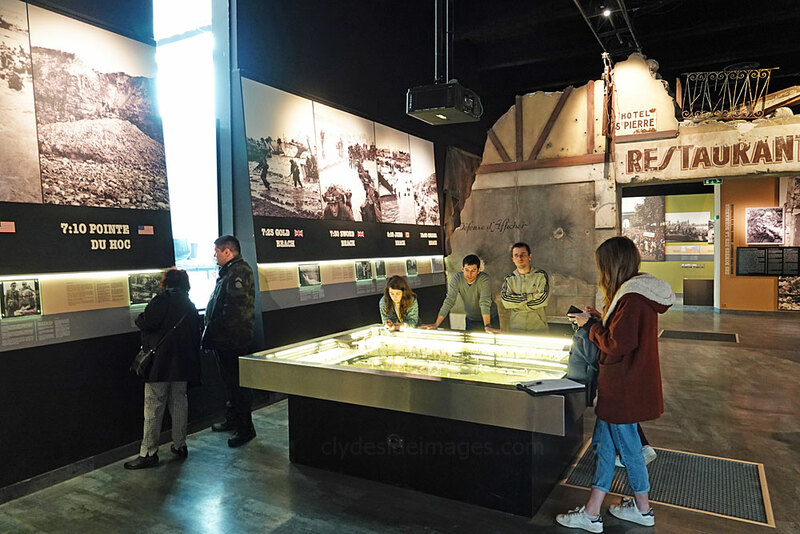 Additions to the museum since opening include a gallery dedicated to the Nobel Peace Prize and a Cold War display which includes a Mig-21 fighter jet, a deactivated thermonuclear bomb and a piece of the Berlin Wall. 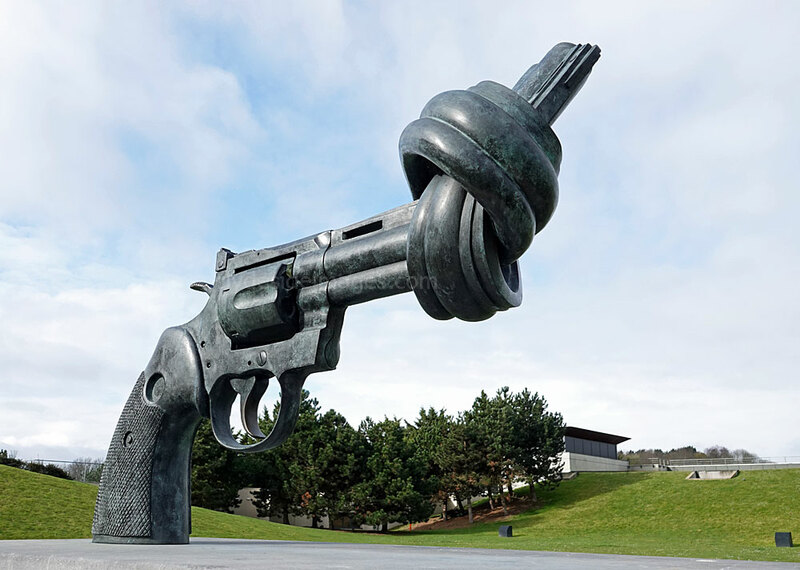 This sculpture titled "Non-violence" is by Swedish artist Carl Fredrik Reuterswärd. 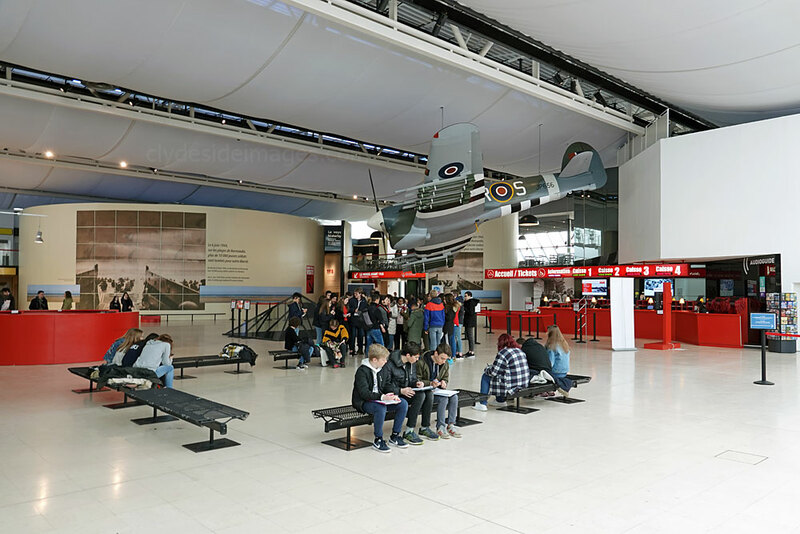 The Foyer / Ticket Office and Typhoon replica. 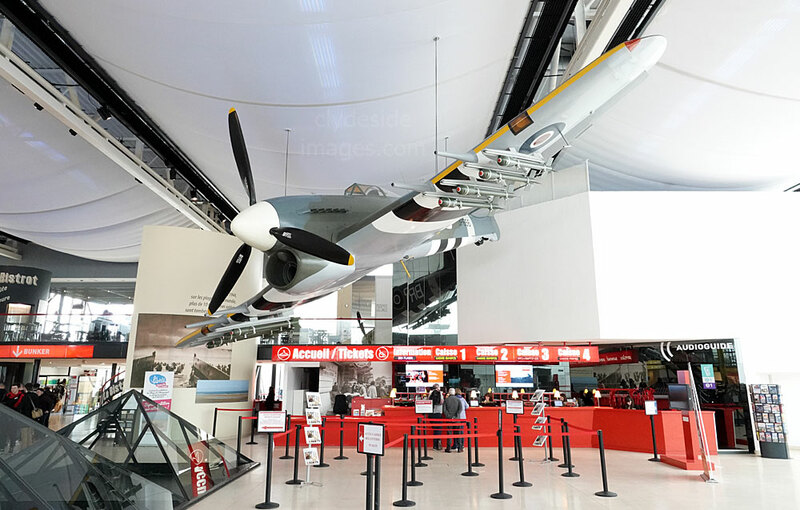 I didn’t check out the Cold War section due to time constraints but the rest of the Caen Memorial has a number of outstanding exhibits, including this full-scale replica of a Typhoon fighter bomber which is suspended above the ticket desk. Only one original Typhoon survives today and is on display at the RAF Museum, Hendon. Pictured on the left below is a Pak 38 anti-tank gun. 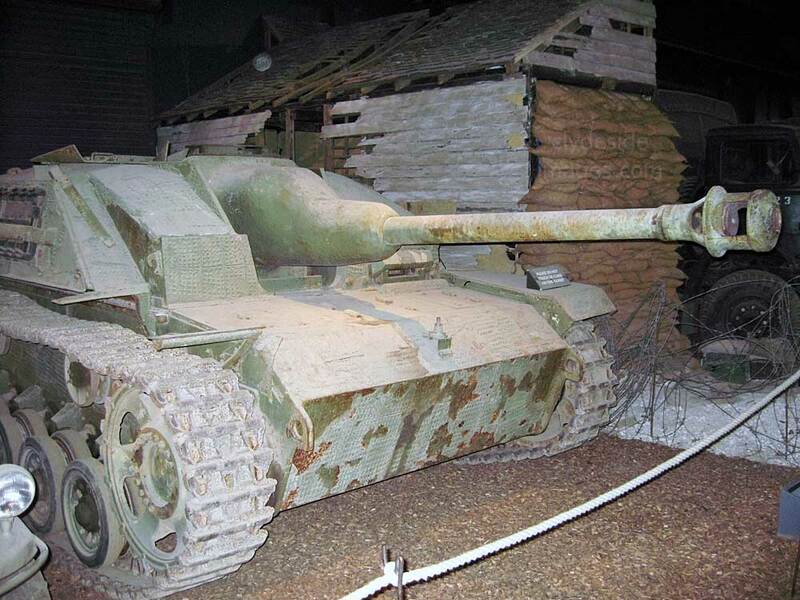 It was used extensively on the Eastern Front where its tungsten-cored projectiles were effective against medium armour but could not penetrate the thicker protection of the heavier Soviet tanks. 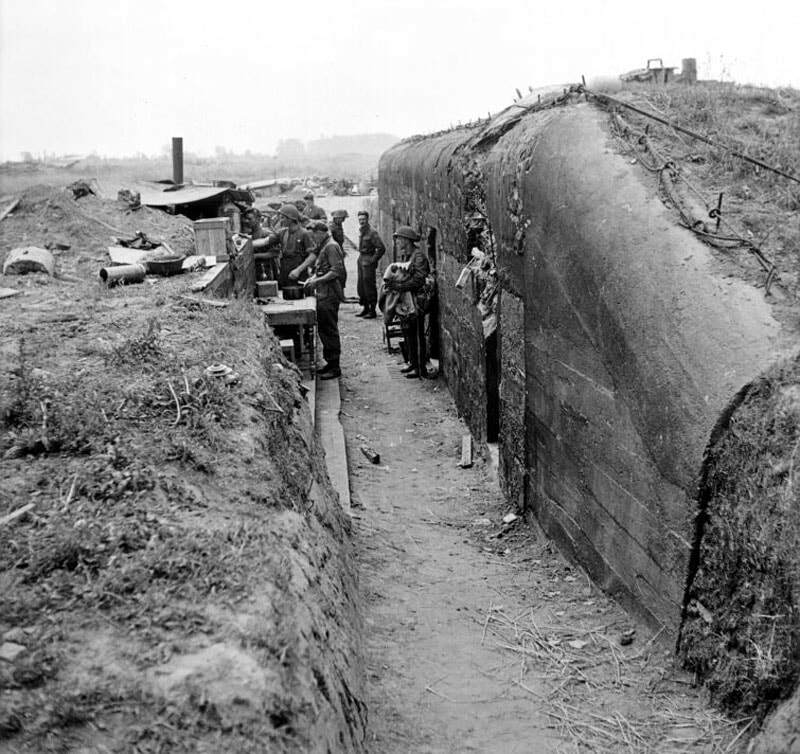 As a result, the gun was gradually replaced on the front line although it continued to equip infantry units manning the Atlantic Wall. 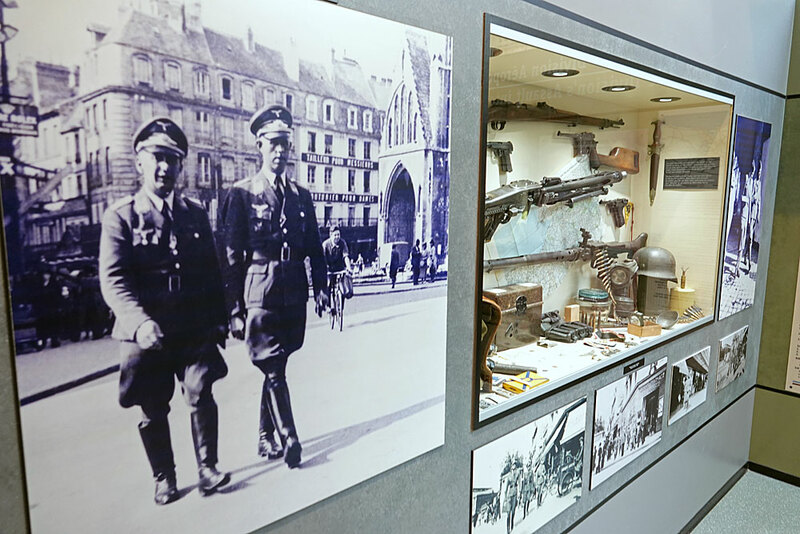 ​Around 400,000 people visit the Caen Memorial annually and if you’re working your way round the basement display areas when parties of highly animated French school kids charge in, it can seem like most of the yearly visitors have arrived at once! 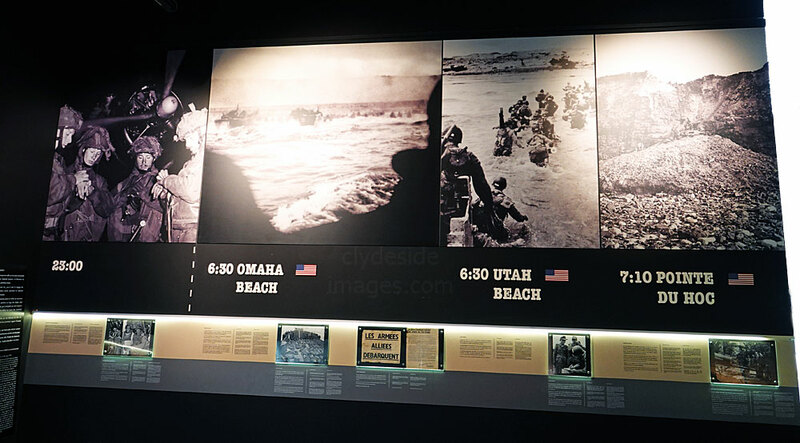 Unsurprisingly, there is a fairly large section relating to Operation Overlord. Above right: Wing Commander R. E. P. Brooker, the No. 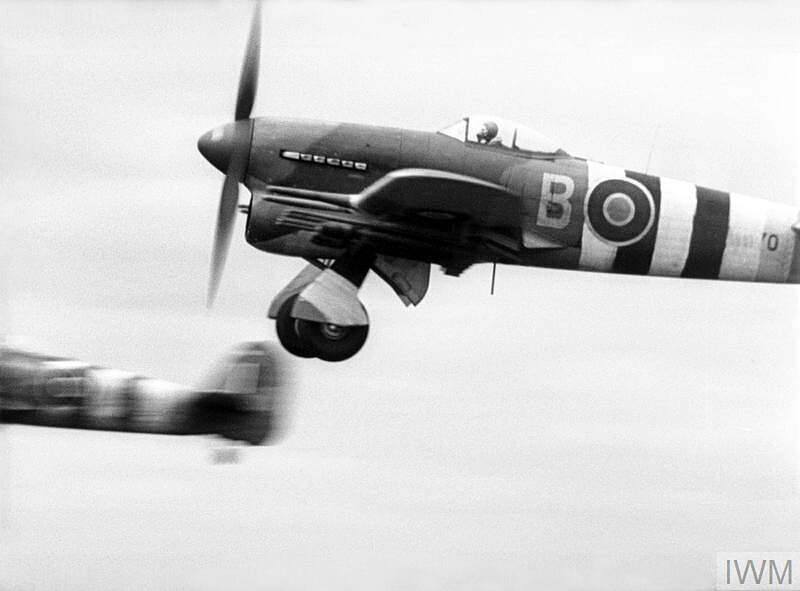 123 Wing Leader, takes off from Thorney Island, Hampshire, in his Hawker Typhoon Mark IB, MN570 with seven more Typhoons of No.198 Squadron RAF, on a sortie over the Normandy beachhead. 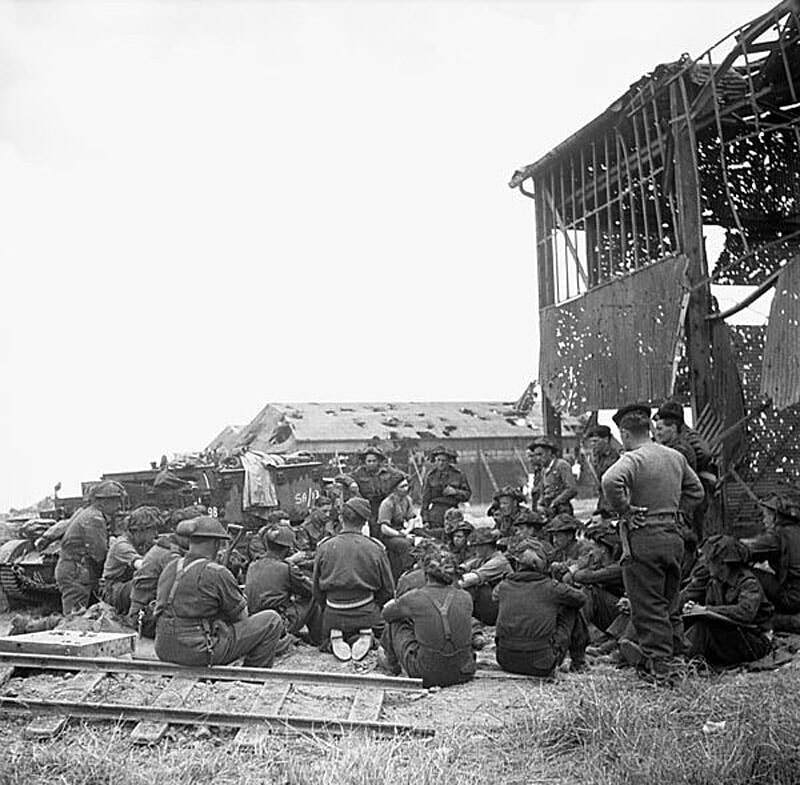 They attacked and destroyed several German armoured vehicles on the Caen-Falaise road. 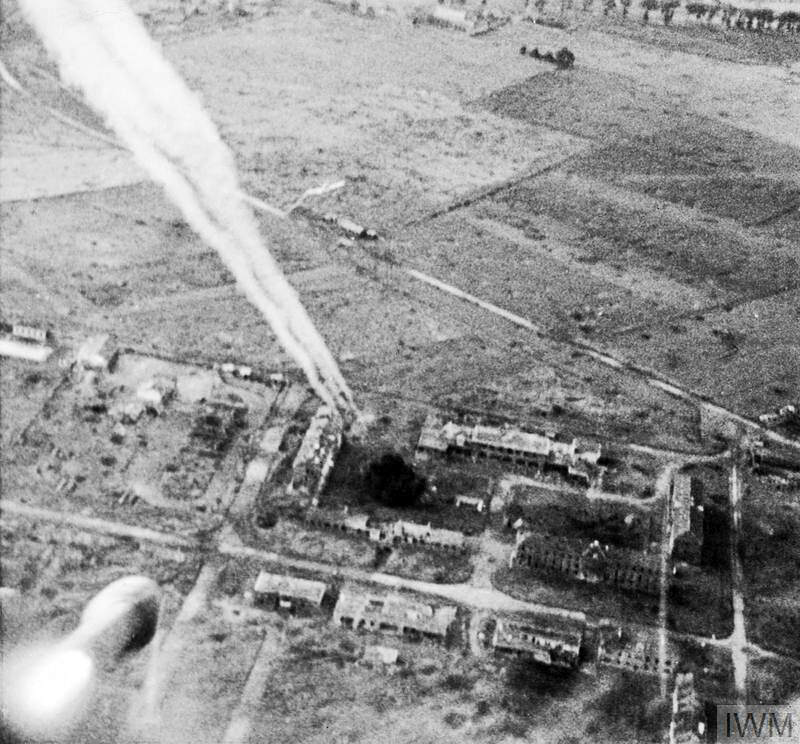 The other image shows rockets fired from a Typhoon of No.181 Squadron, Royal Air Force, streaking towards buildings at Carpiquet airfield. 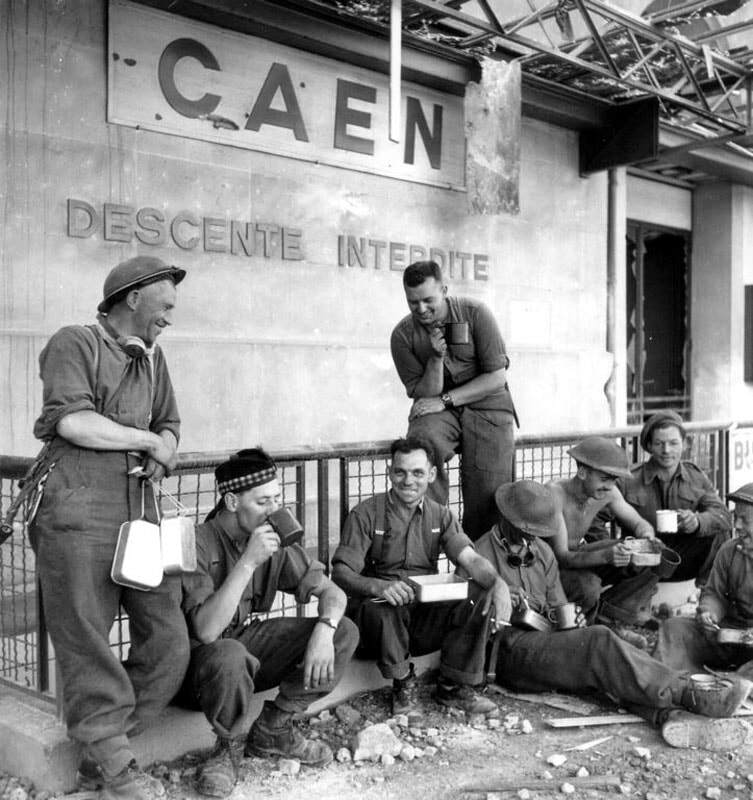 The Canadian 3rd Division finally took Carpiquet to the west of Caen on 4 July after prolonged, bloody fighting. 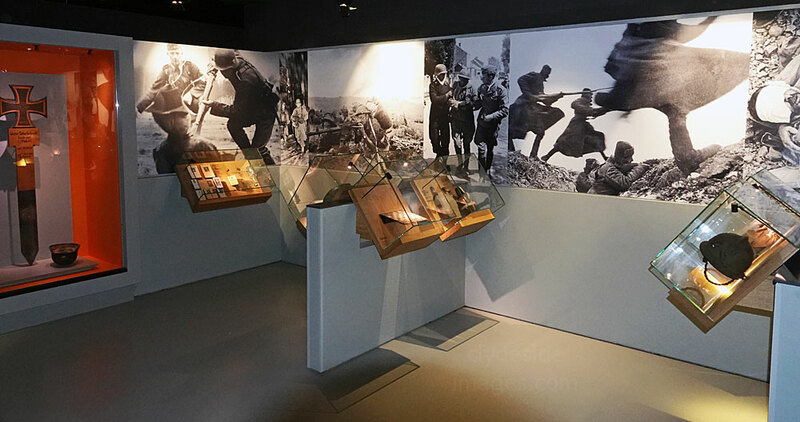 The display on the Spanish Civil War includes a copy of `Guernica`, a mural-sized oil painting on canvas by Spanish artist Pablo Picasso which he completed in June 1937. This work, regarded by many art critics as one of the most moving and powerful anti-war paintings in history, was created in response to the bombing of Guernica, a Basque Country village in northern Spain, by Nazi Germany and Fascist Italian warplanes at the request of the Spanish Nationalists. 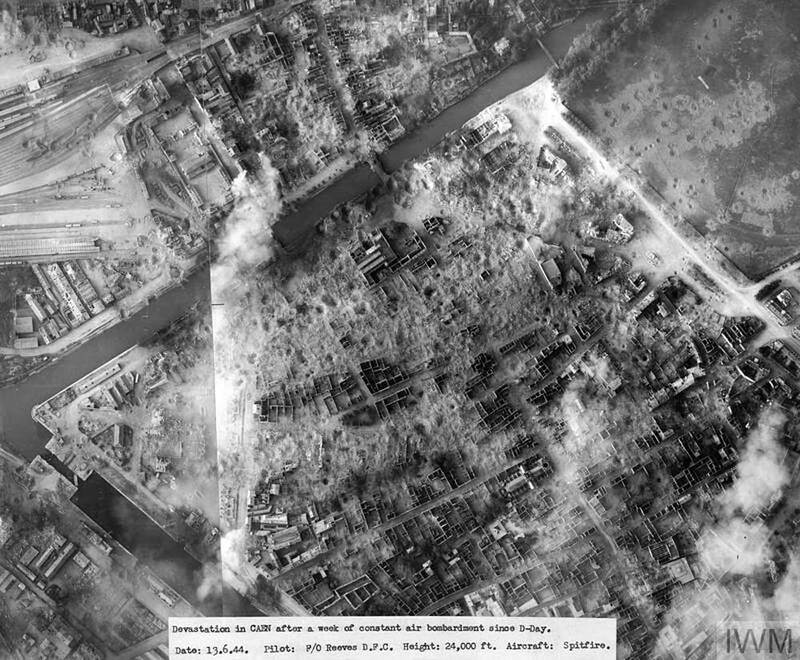 The painting shows the population`s terror and the widespread destruction caused by mass aerial bombing and immediately draws comparisons with Caen, as its citizens would experience an even more devastating attack less than a decade later. 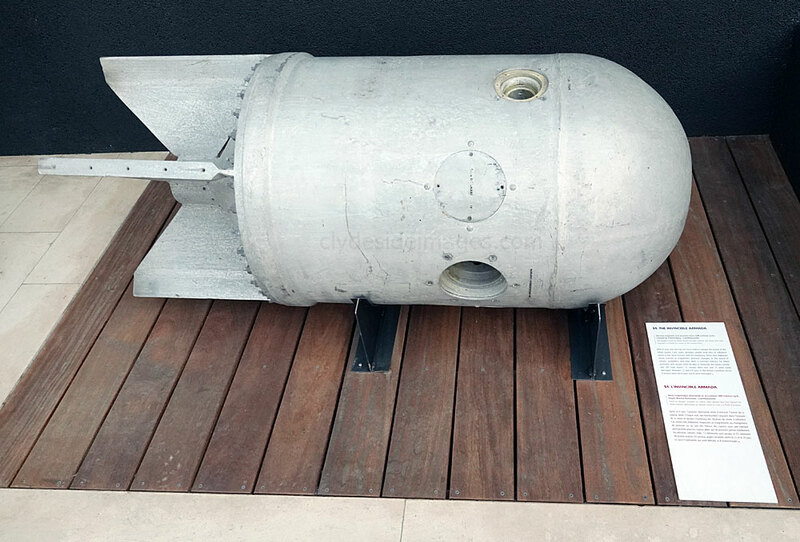 Above: An anti-shipping mine and a `Rupert`. At least 500 of these 3ft high stunt puppets were dropped along with S.A.S. 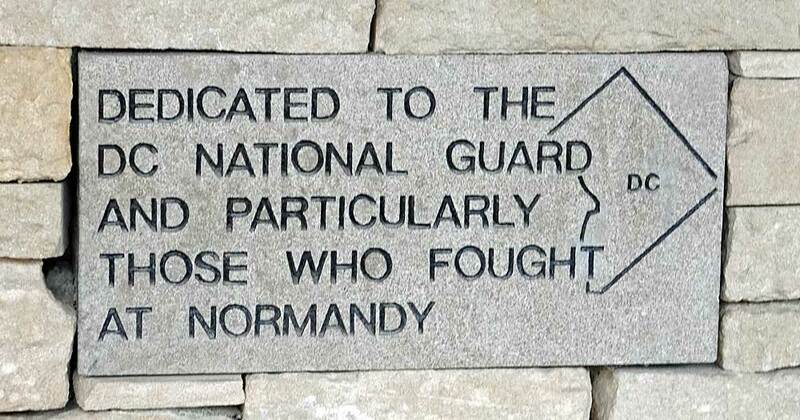 soldiers at several locations well away from the Normandy beaches and genuine Allied drop zones to fool the enemy into thinking a major attack was underway. 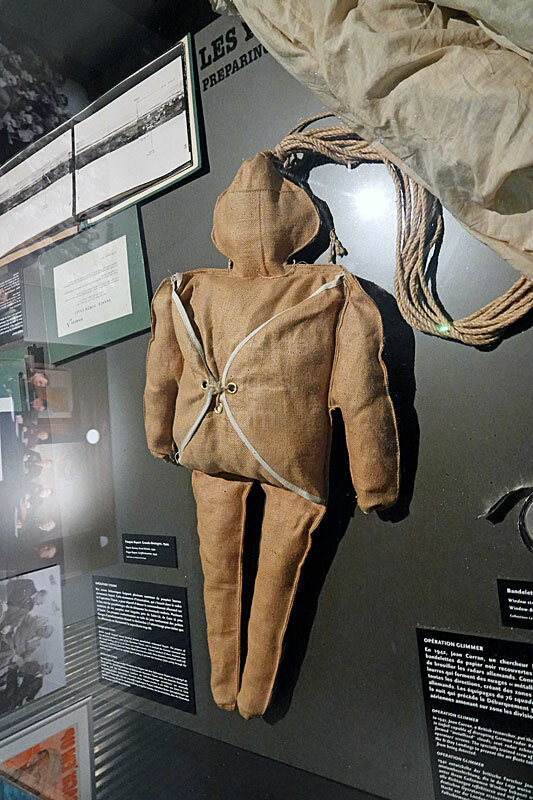 Sent in the middle of the night, these canvas dummies were designed to let off firecrackers then burst into flames when they landed so the Germans wouldn`t realise what they were. The deception was greatly augmented by a small band of SAS soldiers who parachuted in with the dolls, equipped with loudspeakers through which they played the sounds of a fierce gun battle. Although the Ruperts were only half the size of an average human, they would have appeared lifelike to those looking up from ground level on a dark night. The Luftwaffe made almost no attempt to disrupt the Landings on 6 June but in the weeks that followed, bombers would make nightly raids on the fleet gathered offshore and would also drop mines in the Seine Estuary and in the sea off Cherbourg. 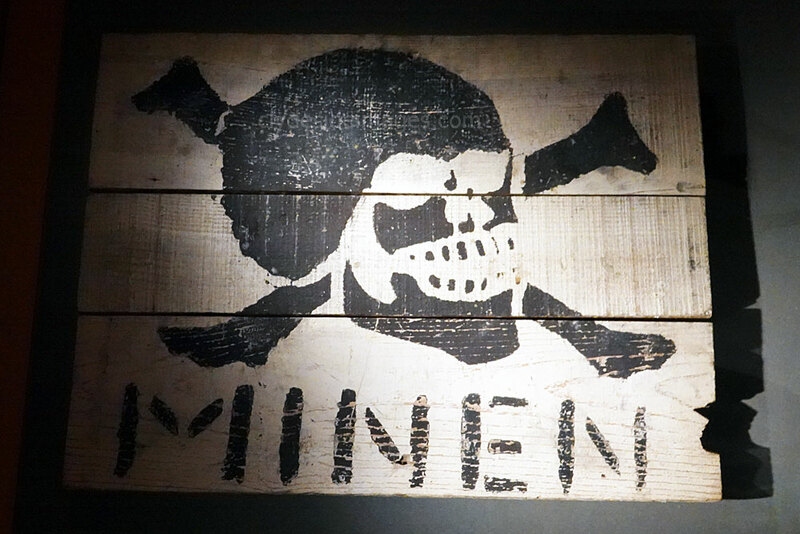 Many of these mines, like the one pictured on the left, were fairly sophisticated and would react to magnetic and acoustic signatures, posing a constant threat to Allied vessels. 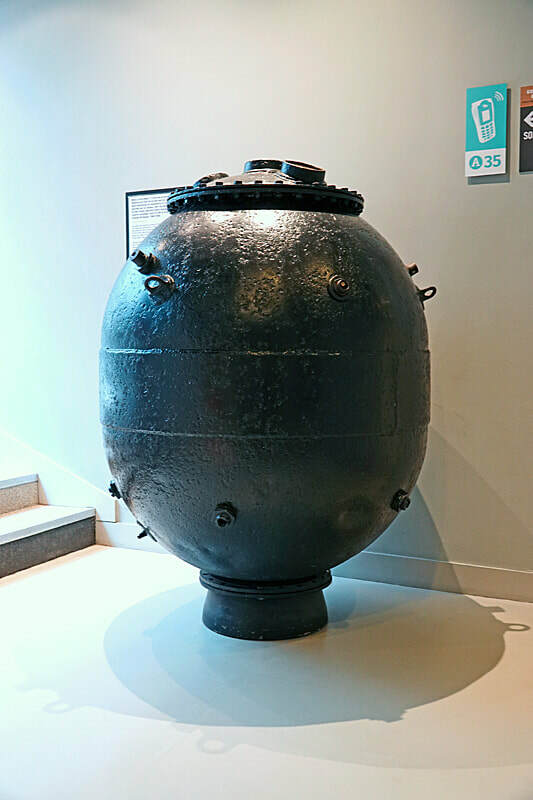 Off UTAH Beach, 12 vessels were lost and 25 badly damaged and between 22 - 29 June, in the British-Canadian sector, 9 vessels were destroyed and 8 damaged by these weapons. 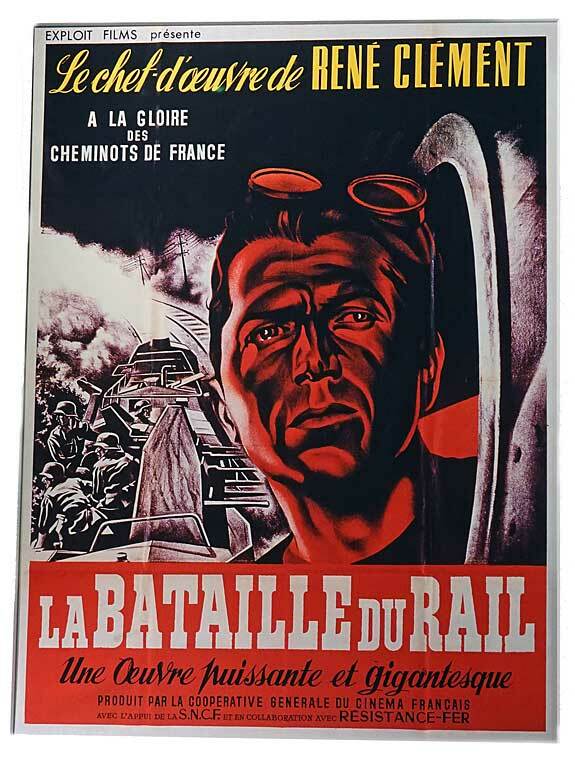 Below: ​Just a couple of the posters on display: The one on the left publicises the 1945 film `La Bataille du Rail`, directed by René Clément (1913-1996), which tells the story of the resistance mounted by French Railway Workers during the Second World War. 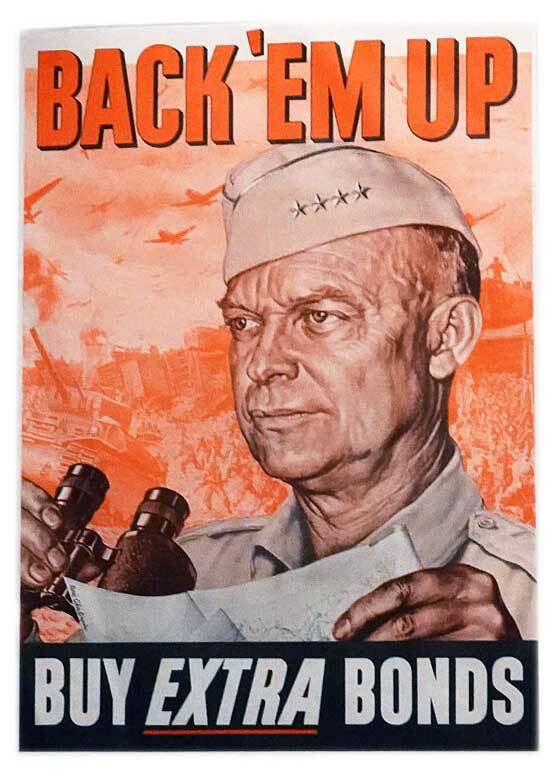 The other promotes the purchase of war bonds in the USA. 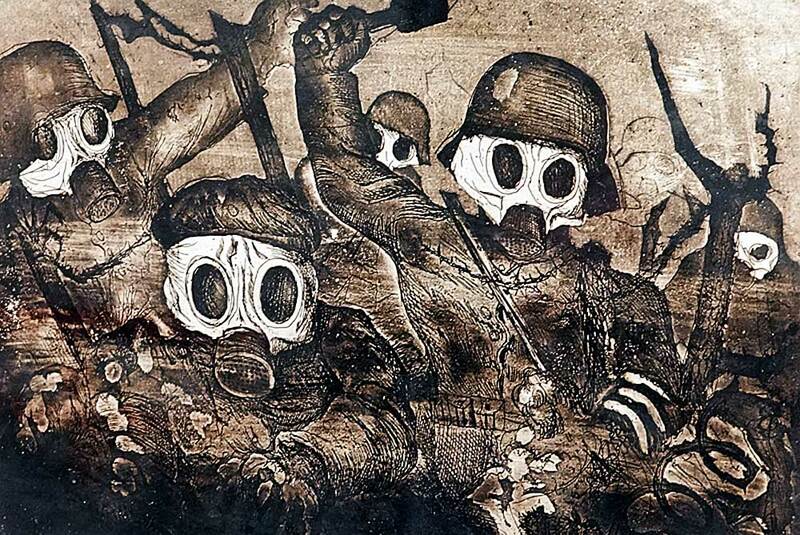 Below: This is a copy of `Stormtroopers Advancing Under Gas` (1924), an etching by German artist and ex-soldier Otto Dix (2 December 1891 - 25 July 1969). 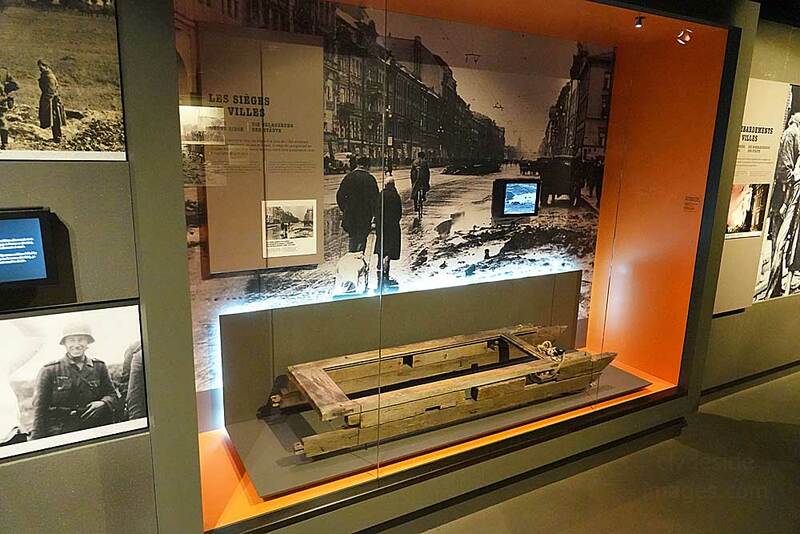 ​At the outbreak of the Great War, Dix was an enthusiastic volunteer and in 1915, like hundreds of thousands of his countrymen, he was sent to the Western Front where he was awarded the Iron Cross. He was wounded a number of times but survived, despite coming close to death on one occasion after sustaining particularly severe injuries. 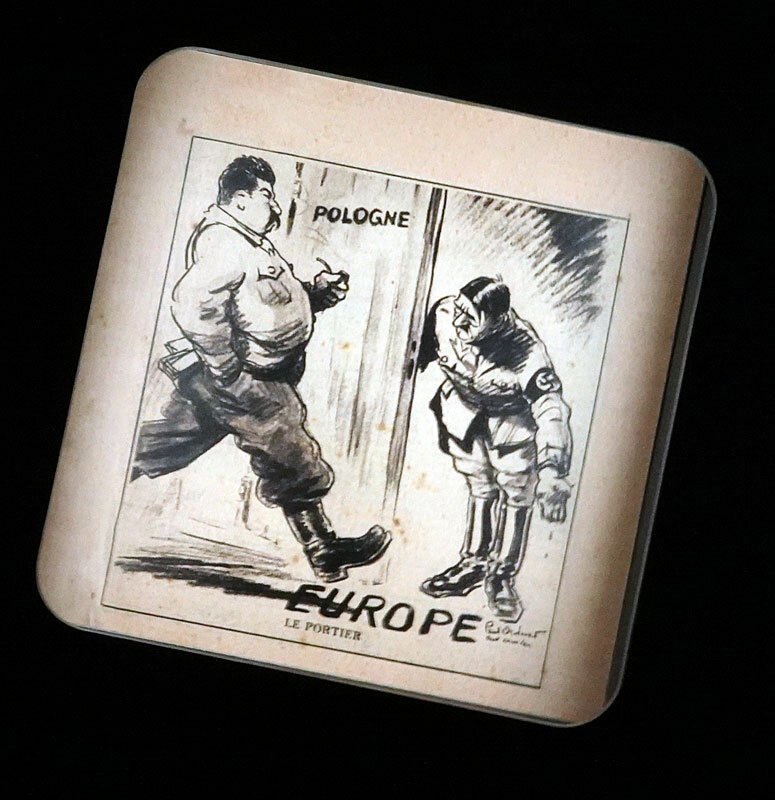 Following the Armistice, Dix found his political views changing and he became increasingly angry over the way in which ex-soldiers, especially the wounded and disabled were treated in Germany. His work took on a graphic anti-war character, showing the horror experienced by those who fought, and paintings included decomposing bodies and wounded troops in writhing in agony. The public was so outraged by his first painting displayed in public, `The Trench`, that the director of the art gallery in which it was displayed was forced to resign. Dix became an art tutor at the Dresden Academy and during Adolf Hitler`s rise to power Dix`s anti-war paintings became increasingly controversial and eventually he was forced to leave his position. When the Nazis seized control, two of Dix`s works were selected for an exhibition to discredit and ban modern art and a number of his other anti-war paintings were later destroyed by the regime. In 1939 he was arrested on the false charge of being involved in a plot to assassinate Hitler but was eventually released. 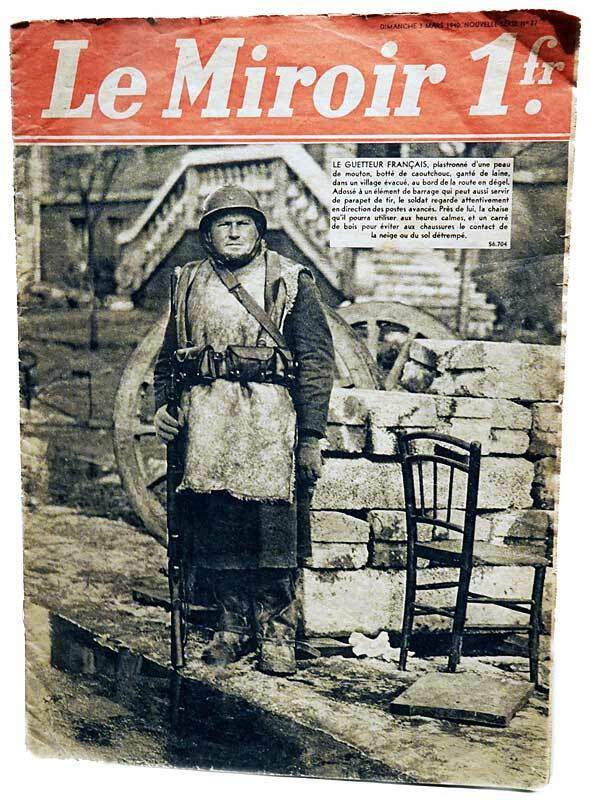 During the Second World War, Dix was later conscripted into the Volkssturm, roughly similar to the British Home Guard, and was captured by French troops just before the conflict ended. He was released in February 1946. 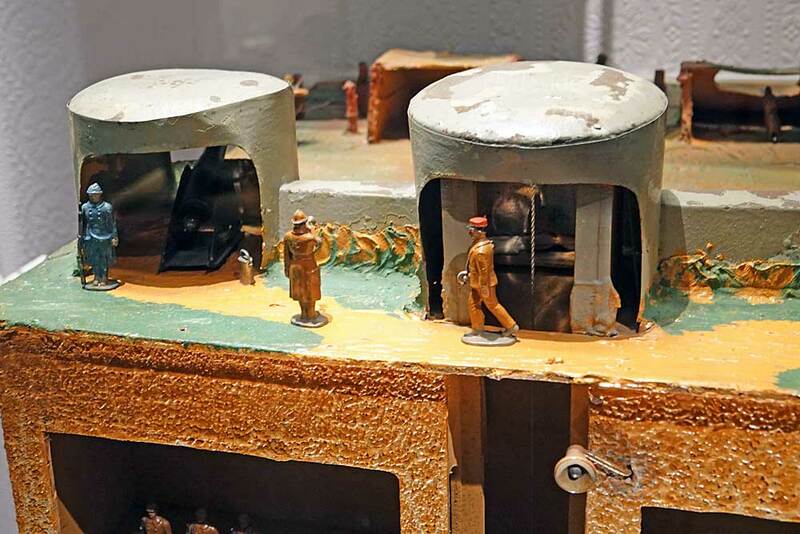 ​Above: A rather crude model of Maginot Line fortifications. Named after the French Minister of War André Maginot, this was a series of inter-linked concrete gun emplacements, bunkers, machine-gun nests, obstacles, and other installations built by France in the 1930s to deter invasion by Germany, after the latter`s rapid advances following the outbreak of war in 1914. 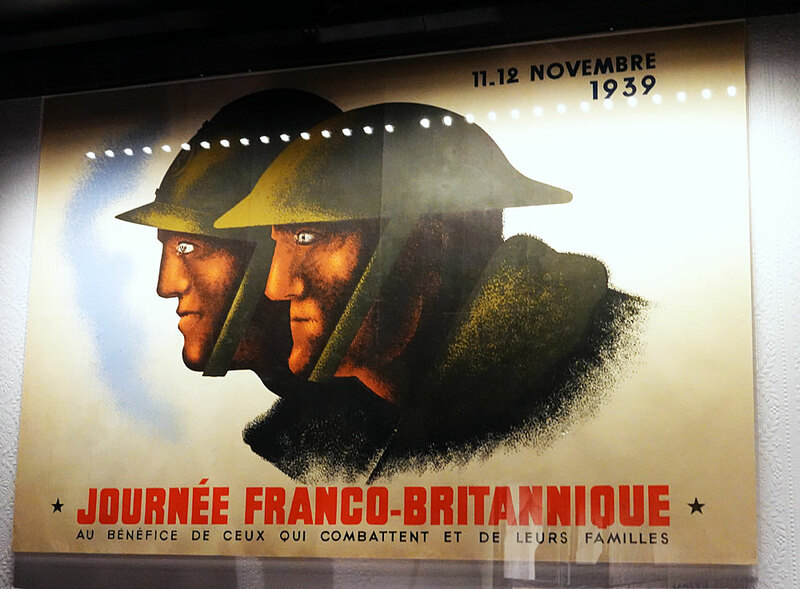 The Maginot Line stretched along France`s borders with Italy, Switzerland, Germany, and Luxembourg, but did not extend to the English Channel coast due to French strategy that envisioned a move into Belgium as a counter-stroke. 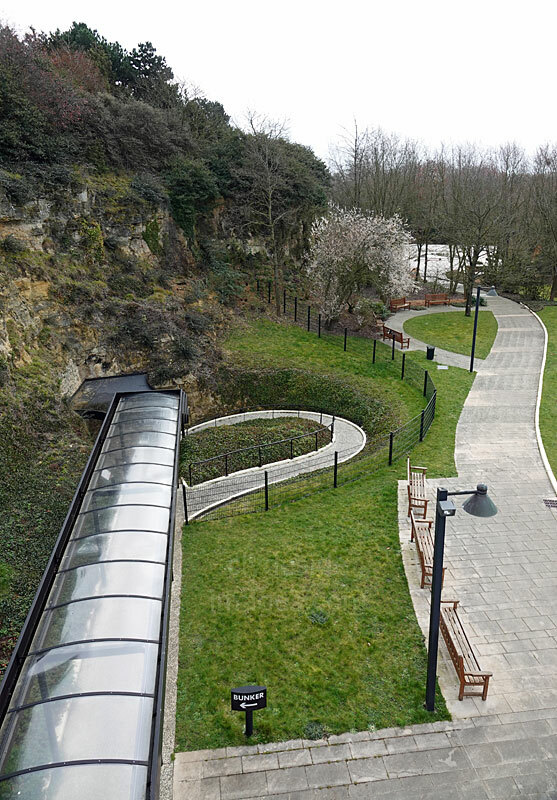 ​The defences were impervious to most forms of attack, including aerial bombardment and direct tank or artillery fire, and had underground railways to move troops and ammunition quickly and safely. In the event of prolonged periods underground, air-conditioned living conditions for garrisoned troops, made their stay more comfortable. 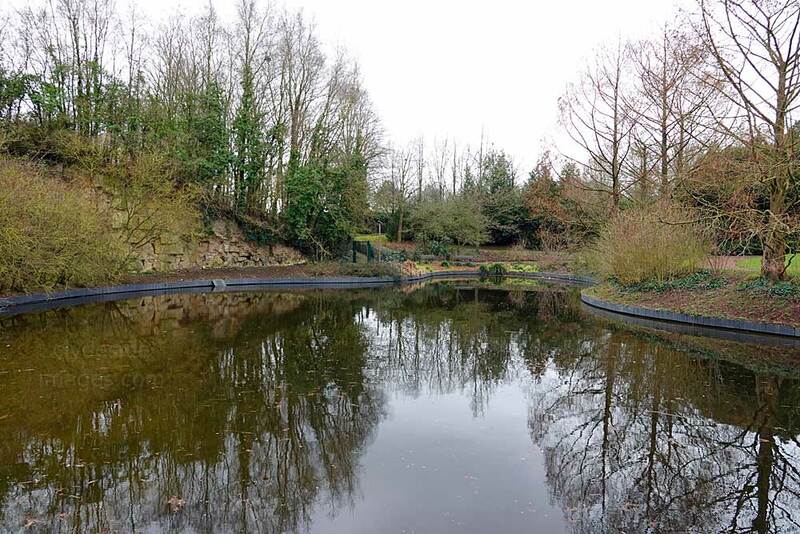 The innovative nature of France`s state-of-the-art defences ultimately proved useless, however. Although the Germans invaded through the Low Countries, bypassing the Maginot Line to the north, as the Allied armies mobilised the Germans made a surprise thrust through the Ardennes forest, a region which the French had ruled out for a large-scale advance due to the rough nature of the terrain. ​Hitler`s Panzers rapidly crossed the River Meuse and encircled much of the Allied opposition, resulting in hundreds of thousands of troops being evacuated from Dunkirk (above) and other Channel ports. The remaining forces to the south, including those stationed in the Maginot forts, were unable to prevent most of France being overrun before an Armistice was declared. 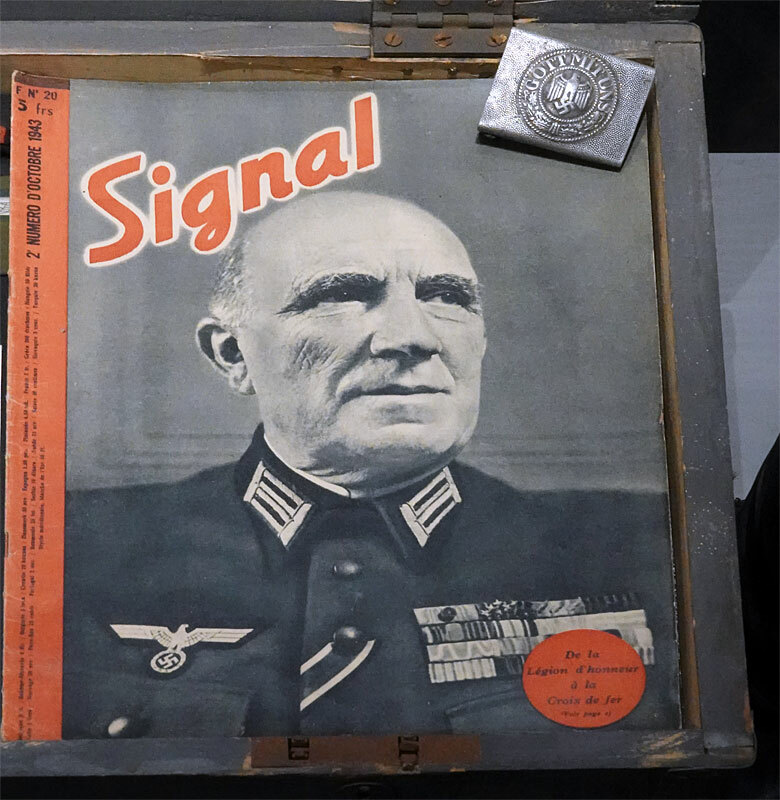 Between June 1941 and May 1945, Nazi Germany and the Soviet Union were embroiled in a cataclysmic struggle on what became known as the Eastern Front. 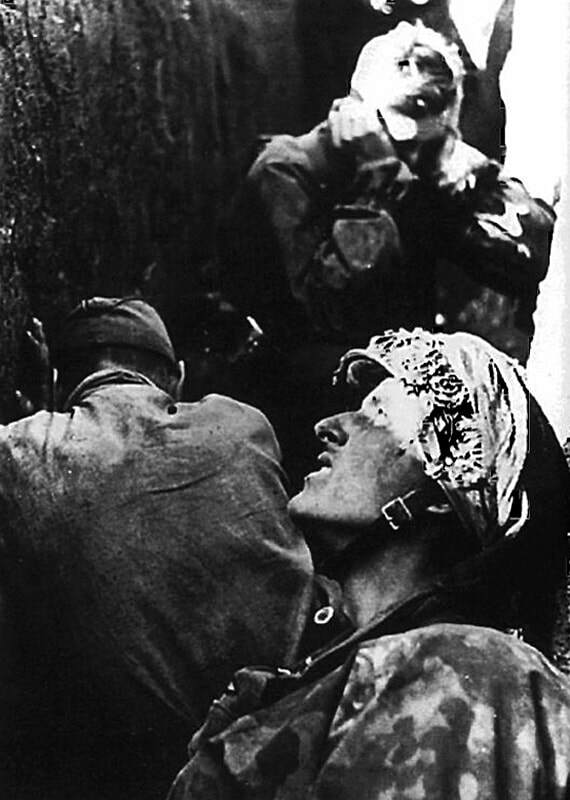 Following the Germans` surprise invasion, code-named `Operation Barbarossa`, the resulting conflict became one of the largest and deadliest military duels of all time, and ultimately led to the fall of Hitler`s Third Reich, ending the Nazis` conquest of Europe. It was also a clash of arms marked by strategic blunders, mass atrocities and human suffering on a previously unimaginable scale. 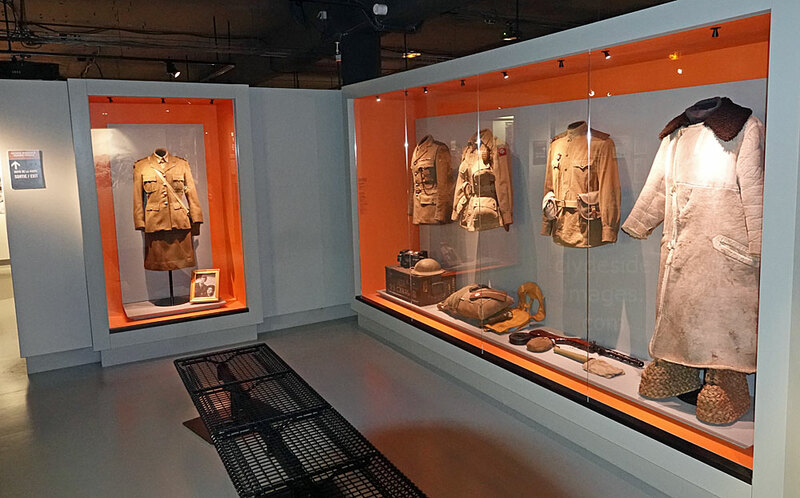 The Caen Memorial has a hall relating to the `Eastern Front` also known as the `Russian Front` which includes uniforms, weapons including several vehicles, and other items of interest. 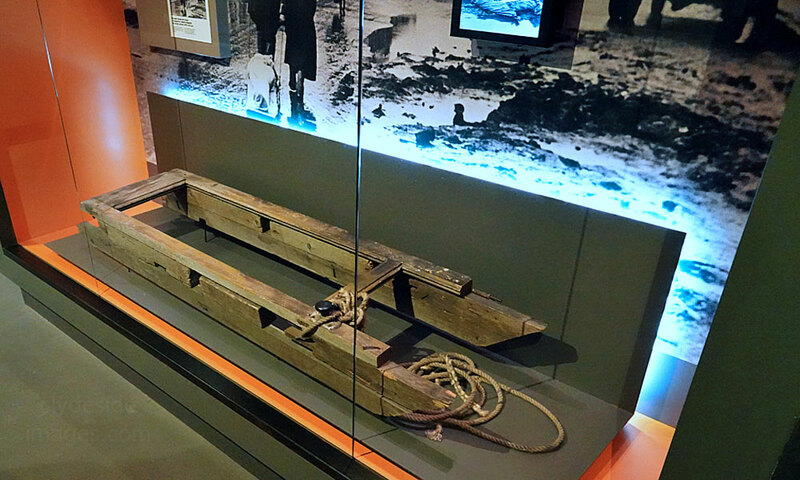 The sled displayed is similar to those used by the besieged citizens of Leningrad to move not only belongings and supplies but also the bodies of those who died of starvation or froze to death. 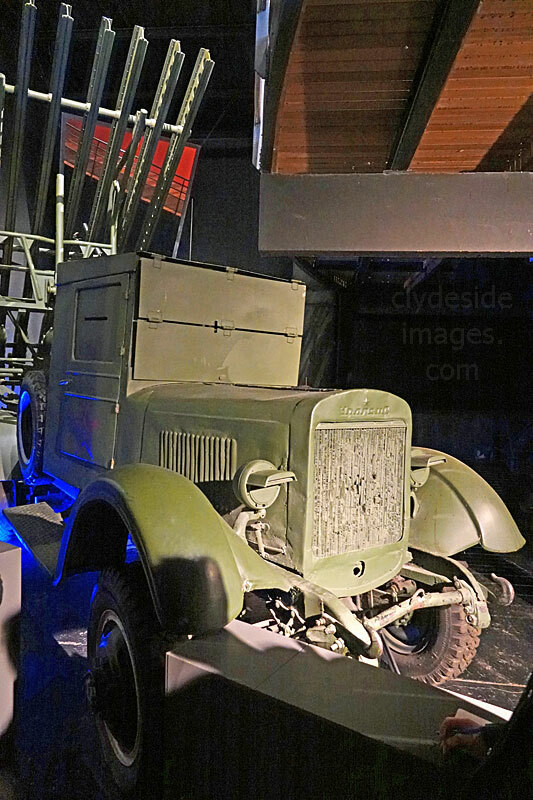 The Katyusha multiple rocket launcher fielded by the Soviet Union in World War II was extremely effective in saturation bombardment and was particularly feared by German soldiers. 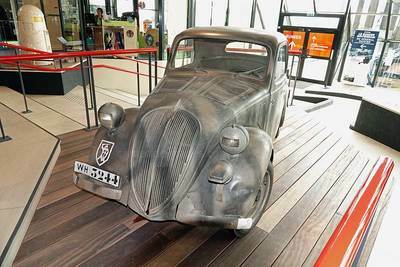 The weapon was cheap to produce and usable on any chassis with vast numbers mounted on ordinary flatbed trucks, such as the one seen here. 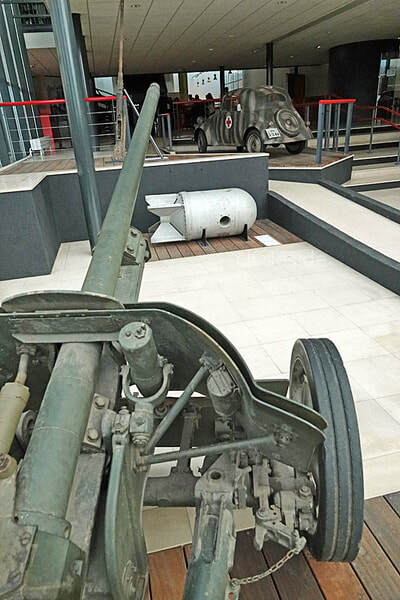 This mobility gave the Katyusha the ability to change position immediately after launching its devastating salvo, reducing the risk of becoming the target of counter-battery fire. Numerous variants were developed during WW2 and beyond and the basic design is still in use with many countries across the globe. Thousands of Sherman tanks like the example above were delivered to the UK and Soviet Union under the Lend Lease policy, before the USA entered the war, and the supply of vehicles, weapons and other equipment continued until the Japanese surrender on 2 September 1945. 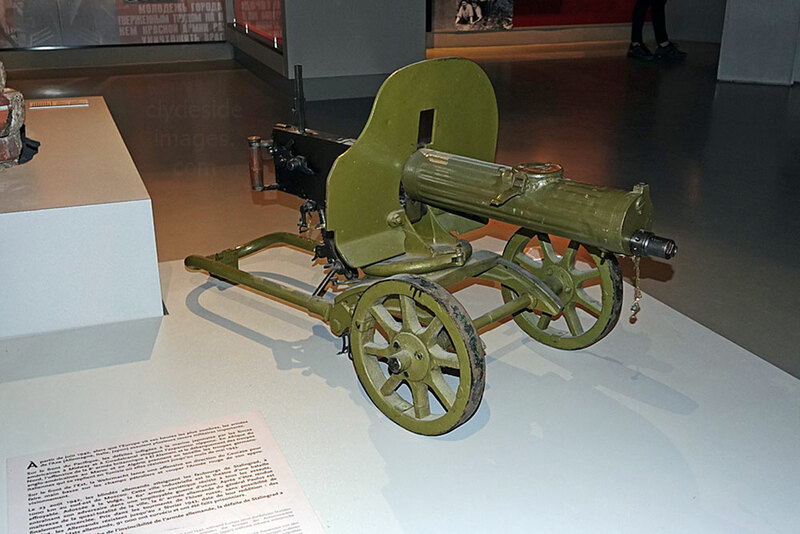 The distinctive PM M1910 heavy machine gun (top right) dates from 1910 and was used extensively by the Imperial Russian Army during World War I and the Red Army during Russian Civil War then World War II. 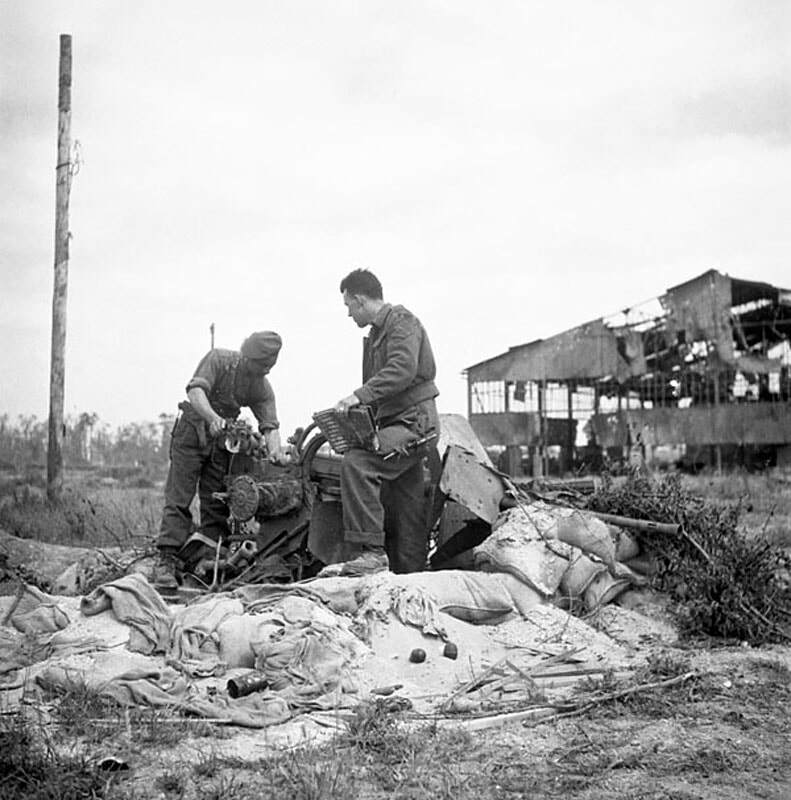 Later, the gun saw service during the Korean War plus the Vietnam War and numerous other conflicts around the world. 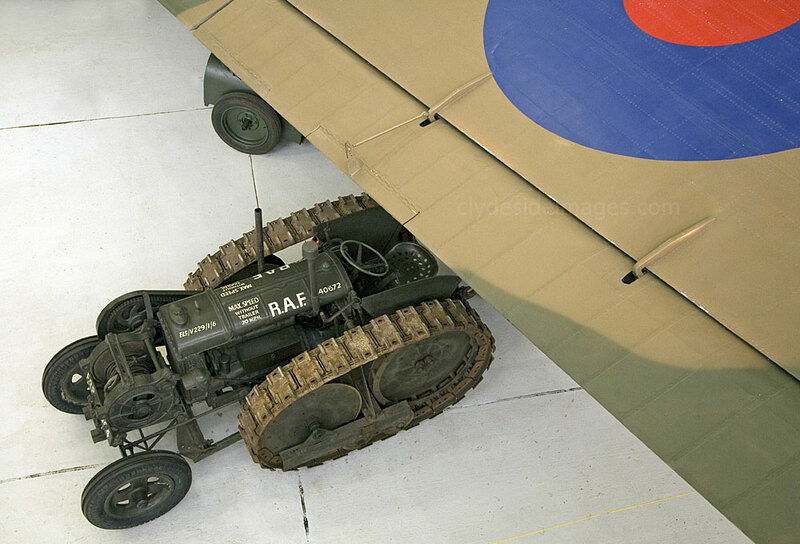 The infantry version was mounted on a wheeled mount with a gun shield but there were aircraft-mounted and naval variants. Some were fitted with a tractor radiator cap on top of the water jacket to allow handfuls of snow to be packed in to melt while firing. 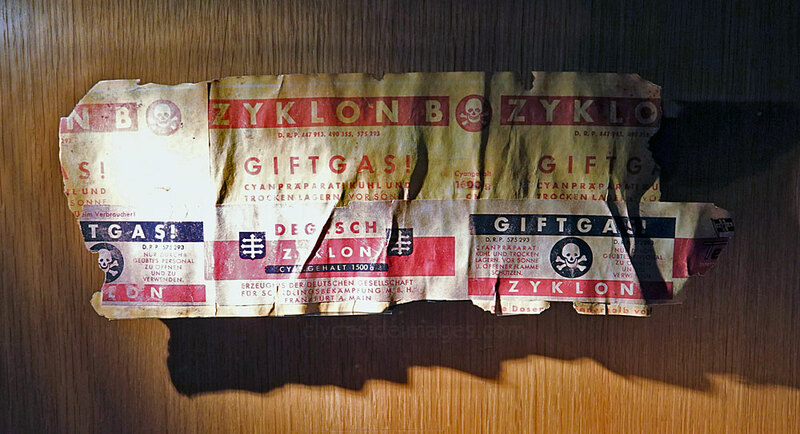 Even though it`s only a facsimile, one of the most chilling exhibits is this label from a can of Zyklon B, the gas used by the Nazis to exterminate millions in the death camps during the Second World War. 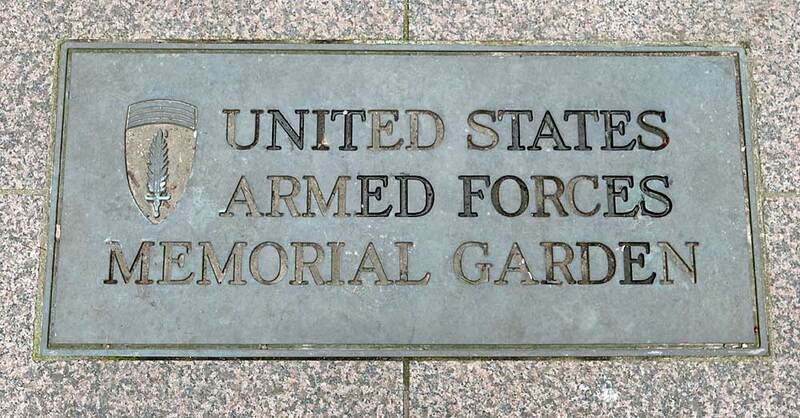 There are also three memorial gardens, The American Garden, The British Garden and The Canadian Garden, dedicated to the three main Allied nations involved in liberating France. This is the former although, like the others, it will be seen at its best in late spring or summer. 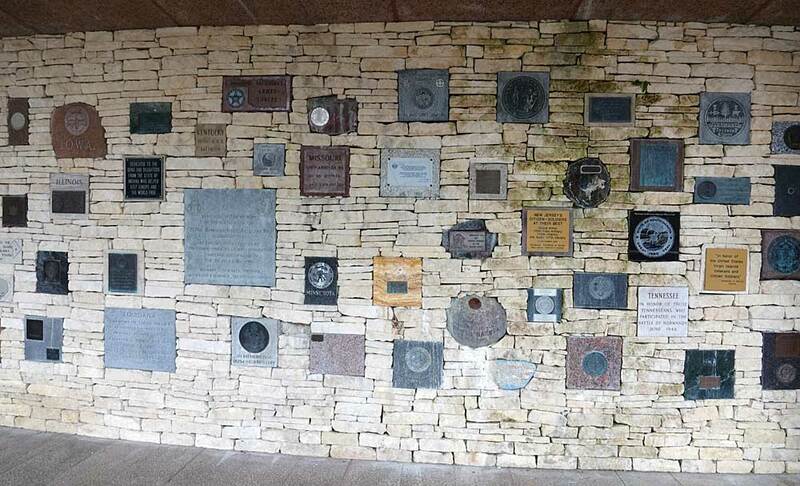 The wall overlooking the pond contains plaques representing the various US units and states that took part in the D-Day Landings and the Battle of Normandy.